Collett 3000g tender number 3002 on the South Devon Railway in 2010. Picture courtesy Dave Bowden. 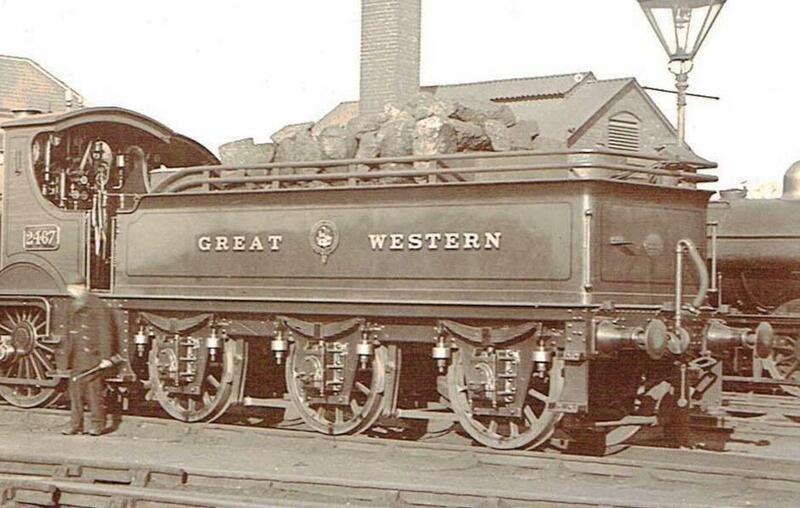 GWR tenders are not documented to anything like the same extent as the locomotives they served. The development of tenders was a process of steady improvement and enlargement, and the few major changes of design didn't always match with changes of CMEs. 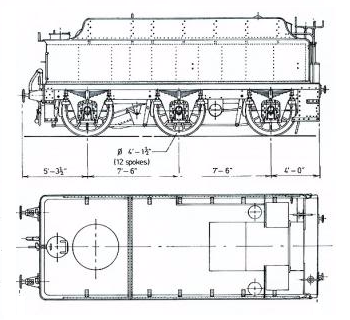 It's hard to imagine a CME getting very excited about tender design, although Churchward is believed to have specified the long bogie tender for the Great Bear primarily for cosmetic reasons. 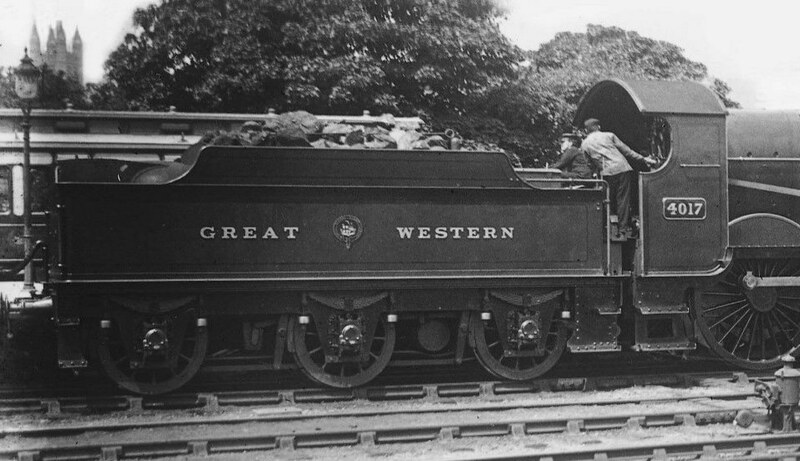 By the 20th century, GWR policy was to own fewer tenders than locomotives as they spent less time being repaired. This both saved capital and having loose tenders taking up space. The result is that tenders were highly standardised, and to a considerable extent interchangeable. Kings, for example, averaged over 20 different tenders during their 30- to 35-year working lives, and one preserved tender was attached to 26 different locomotives in a 31-year working life, after which it was used as an oil storage tank for another 23 years until it reached preservation 1. Broad gauge style, behind Iron Duke class loco 'Inkermann'. 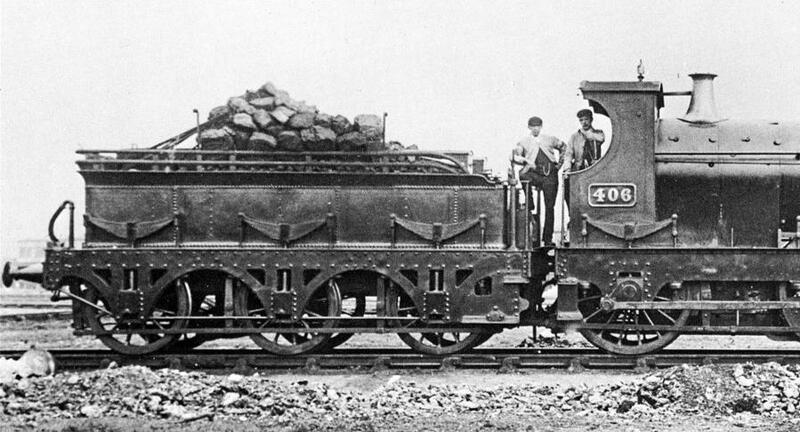 The loco was withdrawn in 1877. 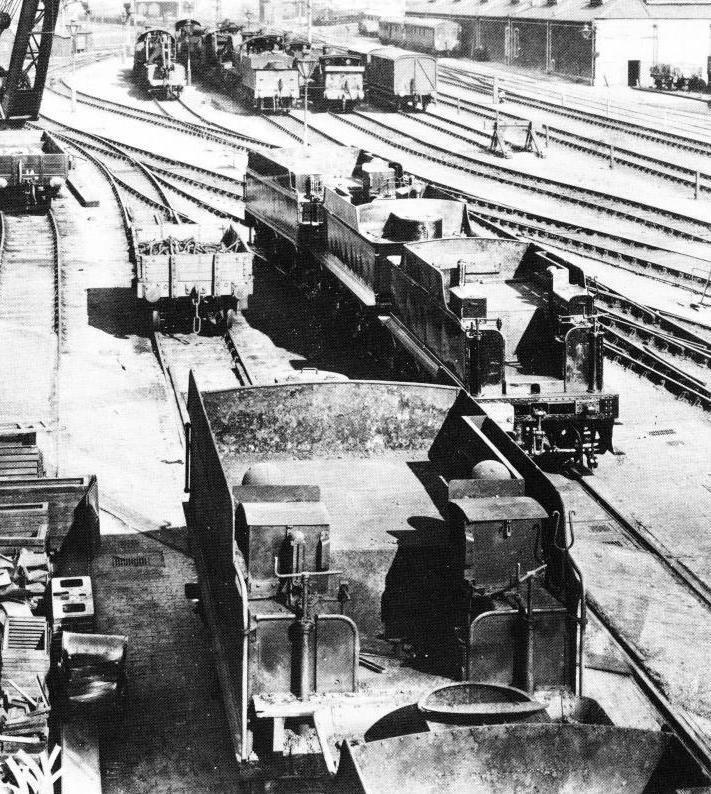 Broad Gauge tenders on Swindon dump, May 1892. These are wide-bodied units, with the springs placed below the platform, and thus can be seen as a precursor of the style adopted for the Dean standard-gauge units. The fillers are round. The tall vertical fixture on some of these tenders is a return pipe from the loco water feed pump. Armstrong-era 6' + 6' wheelbase sandwich-frame well-tank tender, probably 1800g capacity, behind Standard Goods ('388 class') loco 406. 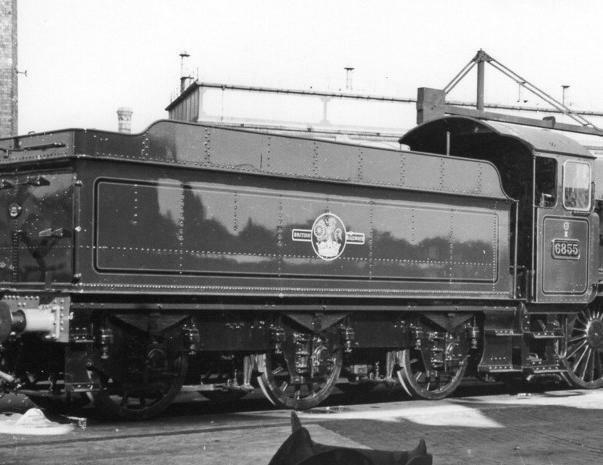 Date unknown, but before the tender was rebuilt to a larger capacity. The tender has coal rails, but note the size of the coal lumps acting as makeshift (although somewhat precarious) fenders. 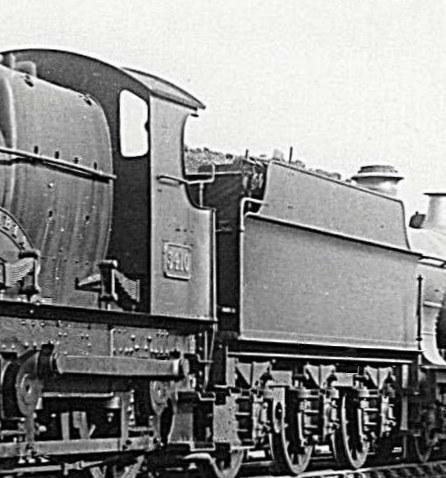 Another Armstrong-era tender behind '111' class 2-4-0 loco 30, the tender probably a Wolverhampton rebuild during the 1870s or 1880s to have a wheelbase of 6'2" + 6'10" and a capacity thought to be 2350g. No coal rails are fitted. The brake rodding on these early tenders was outside the wheels. 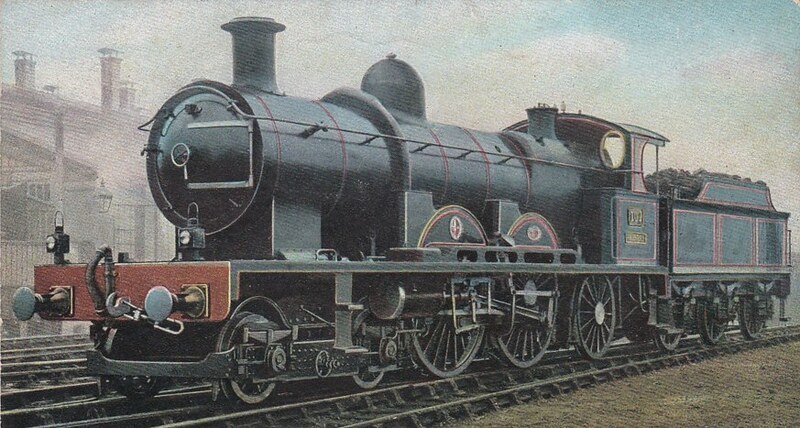 Date unknown (the loco was withdrawn in 1913). 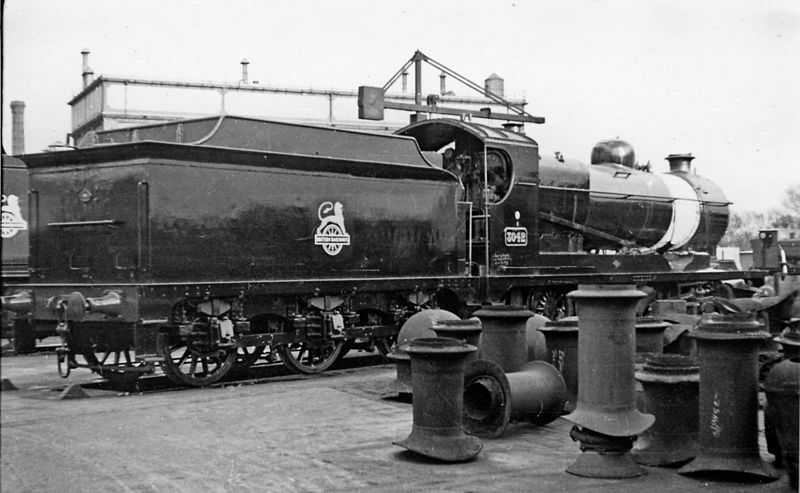 6' + 6'10" Armstrong-era tender in a works-grey portrait behind 'River' class 2-4-0 loco 69 'Avon', showing the deep well tanks. The vertical poles are for carrying the train communication system. 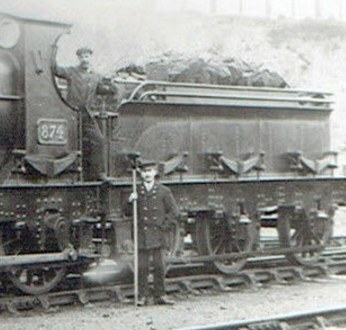 Armstrong tender behind 2-4-0 2215, probably c 1895. It has a later style of frame compared to that of 69 'Avon' above, without apertures, and the spring shackles are now visible. 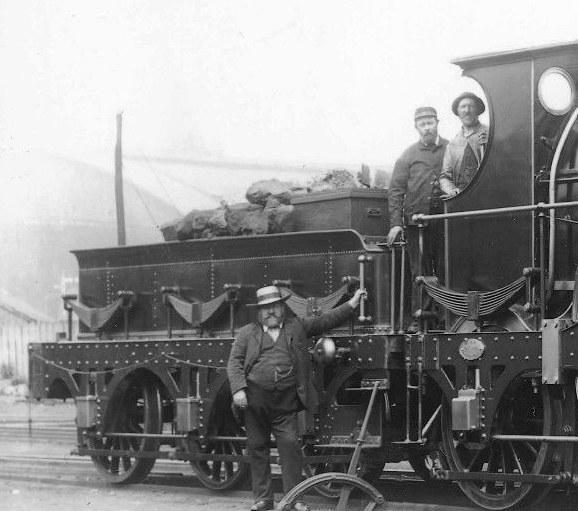 The earliest standard-gauge tenders, like the locomotives they were attached to, were a rather motley collection from a variety of manufacturers. 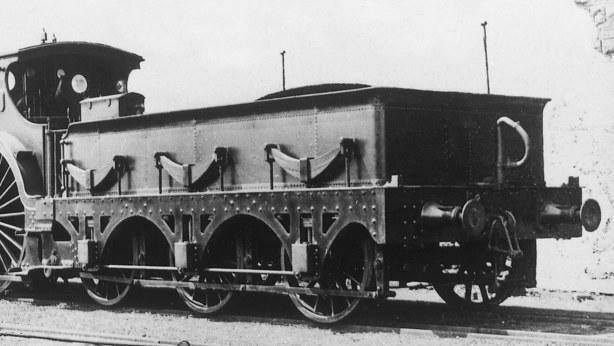 Tenders built for the Gooch-designed classes normally had sandwich frames to match the locomotives. Like the earlier locomotives, many of these tenders were rebuilt/renewed at Wolverhampton in the 1870s and 1880s. The least satisfactory were scrapped around the 1870/80 era, but the rebuilds often lasted until the turn of the century, with the last going in the 1920s. 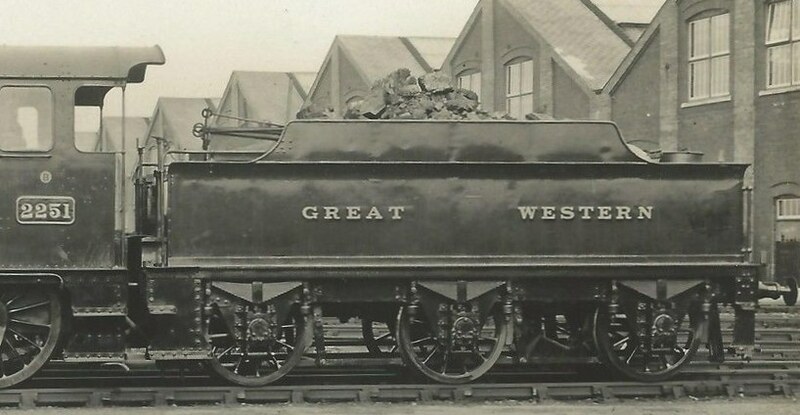 Earlier Swindon tenders had sandwich frames with springs above the footplate and were generally 6' + 6' wheelbase with 4'0" wheels and a water capacity of around 1800g. All these early tenders had well tanks that came down between the frames to a greater or lesser extent. 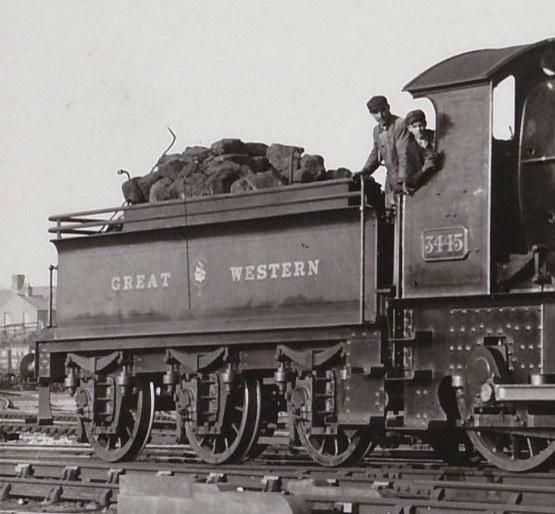 Like so many of the early locomotives the tenders were rebuilt/renewed at Wolverhampton in the 1870s and 1880s, and these rebuilds tended towards a standard 6'2" + 6'10" wheelbase with 4' wheels, as did conversions from the broad gauge. Wolverhampton also built some new tenders to a similar specification. Most of these sandwich-framed tenders lasted until around the Great War, but were withdrawn in large quantities in the 1920s along with older locomotives. One of the Wolverhampton built tenders survived until 1934, and was probably the last one. 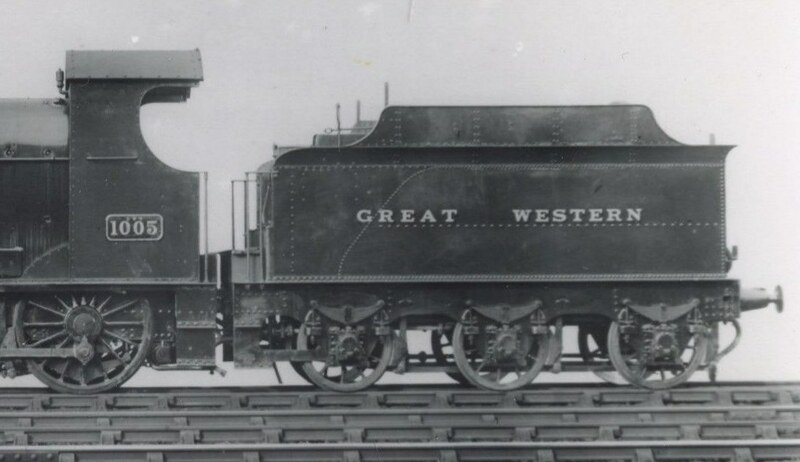 From 1866, Swindon-built tenders had iron-plate frames and most had the now standard 6'2" + 6'10" wheelbase. 306 were built, typically 1800g capacity. A few of these went abroad in WW1, not only with locomotives of the Standard Goods class, but also as water tanks. The last of these was withdrawn from use as a tender in 1929. 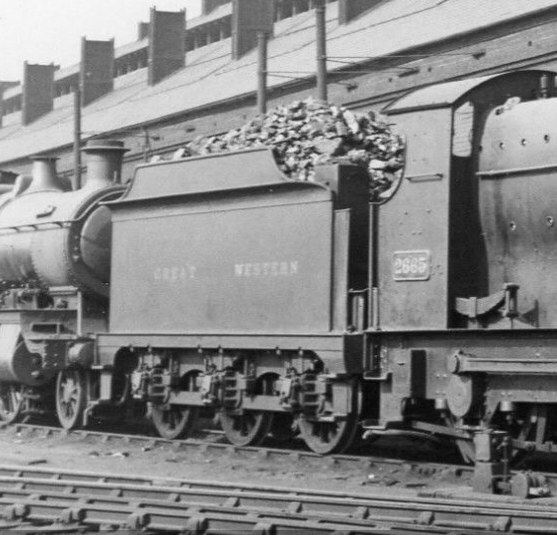 Double-framed tender survivor, now fitted with fenders, behind Standard Goods 510 at Reading, probably c 1925. 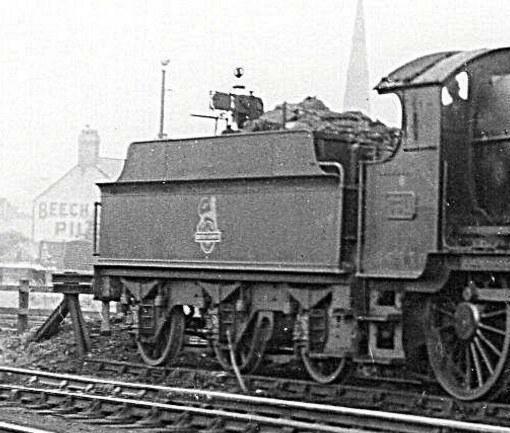 The tender would soon be replaced by a 2500g unit, and the loco was itself withdrawn in October 1929. Behind Standard Goods 598, a late double-framed 6' + 6' survivor, possibly still 1800g capacity, at Chester, c 1920. Blanking plates have been fitted behind sections of the coal rails. The introduction and rollout of the GWR's water trough network was a critical factor in GWR tender development and usage. Here, a 157 'Cobham' class Dean 2-2-2, with its Armstrong tender, takes on water at Goring troughs with a short non-corridor up express c 1900. 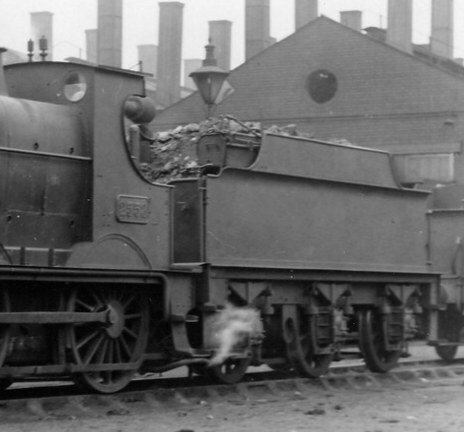 All bar one of the Cobhams had disappeared by 1906, but this tender would probably outlive the loco by many years. 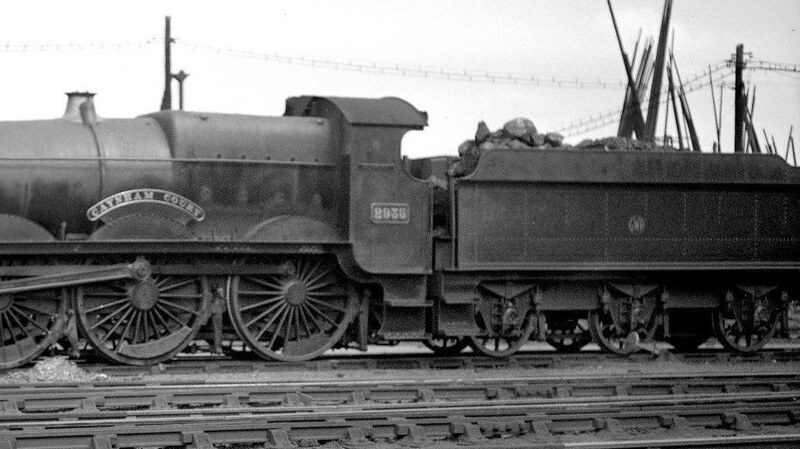 One of the last Armstrong tenders behind '360' class loco 363 at Tyseley, July 1927. 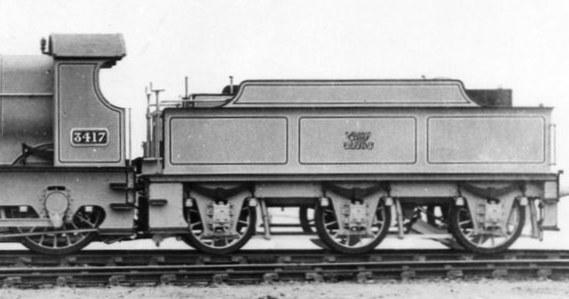 The loco was the last of the class, withdrawn in 1933. There was a general tendency for many tender loco classes to migrate to larger capacity tenders when they became available. The Dukes for example went from 2000g to 2500g to 3000g and the last survivors ended up with 3500g units. Larger 4-4-0s used 2500g, 3000g and 3500g units. 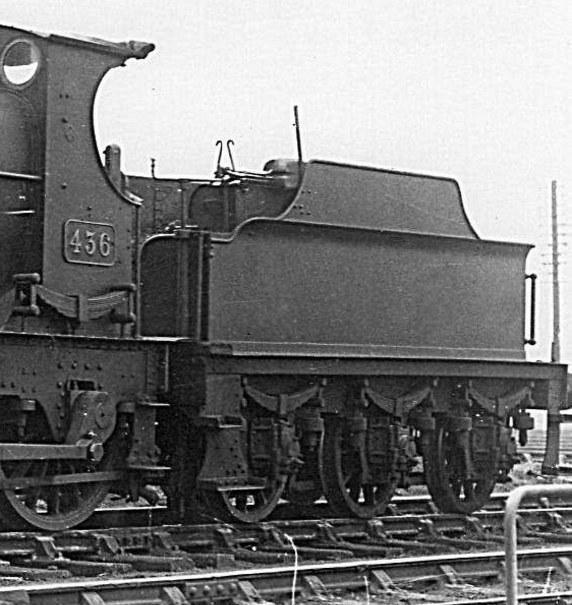 The early 4-6-0s used 4000g, and then 3500g tenders, until the general adoption of the later 4000g units. These transitions produced a cascading effect, with tenders being passed down to older engines. Where necessary, the shoveling plates and handrails of tenders were modified to match the height of the loco fallplate and cab width. 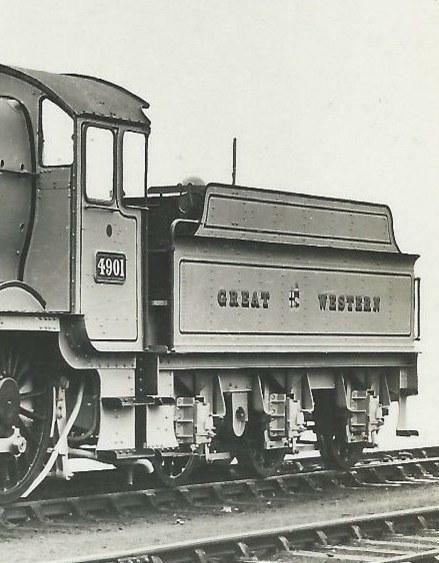 When the 4-4-0s adopted 3500g units, their cab sidesheets were flared out c 1930 to match the tender body width. Tender changing was routine and normal on the GWR. A loco would not be held up at the works awaiting the tender it came in with, the GWR's philosophy being to get overhauled locos back into revenue-earning service as soon as possible. When a loco came into the works, its tender went into the pool, and received whatever maintenance it needed, water tank repairs being the most common area of attention. 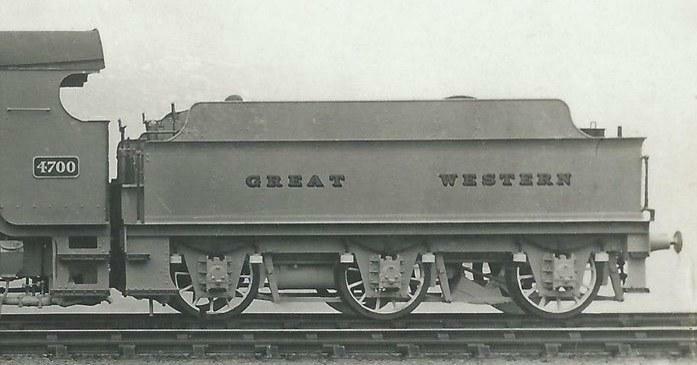 Because tenders could be dealt with more quickly than many classes of loco repair, tenders would usually be likely, subject to suitable matching, to come out with a different loco from a shopping at Swindon, although at the smaller works it was more likely that the loco would get back the same tender. Intervals for tender changing would align with major shopping, which was typically every two to three years for 'large' locos. The shoveling plate was set on a box structure at the front of tender. This Collett 4000g unit originally ran with 4942 'Maindy Hall', and is now earmarked for the 4709 project. Also see a good view of a shoveling plate structure on a typical 3500g unit. the loco cab handrail and the front handrail of the tender should be in approximately the same lateral plane. 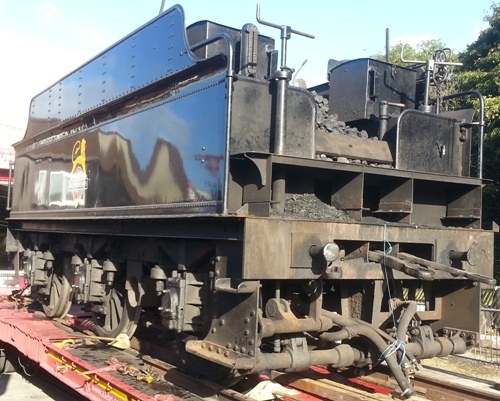 These requirements led to constraints and some inflexibility in choosing what might be readily available from the 'tender pool' when a loco was overhauled. In some cases, particularly at the smaller works, locos retained their original tenders after overhaul. The requirement to match the width of the front of the tender platform to be the same as that of the loco footplate occasionally led to adhocery. Here, a tender platform has been cut back at its front end to match the footplate width of a Dean Goods. Cutting back a tender platform was very rare. After c 1930, it was standard practice to flare out the ends of the 7'6" cabs of 4-4-0s by 3" each side when they migrated up to 3500g units. Here is Bulldog 3410 'Columbia' at Didcot, 7 September 1935. Sometimes things didn't go quite to plan. Duke 3267's cabsheets have been flared out to work with a 3500g tender, but the loco finds itself paired with a smaller capacity one with an unsuitable step height match. 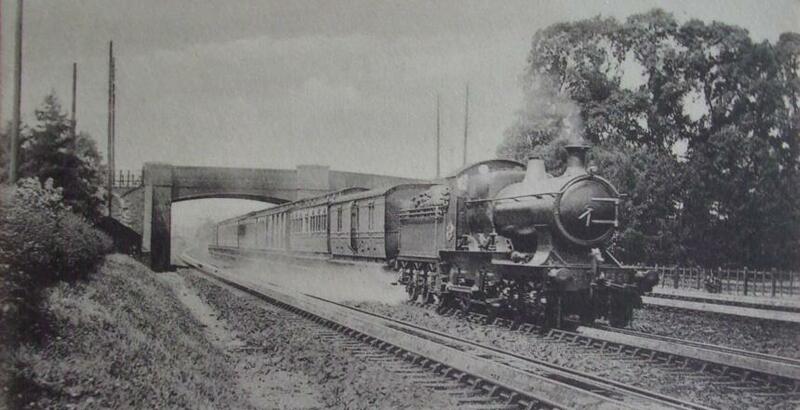 Didcot, c 1932. 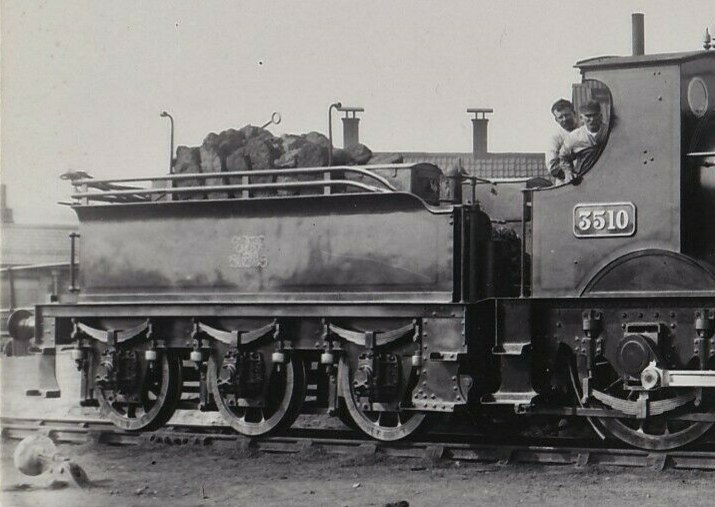 Once a 4-4-0 migrated to a 3500g unit, it was very rare for it to revert to a smaller capacity one. 2000g 6'6" (7' over fenders) probably 7'3"(*) and 8'3", the latter for the early Dukes 4'3½" ? 2500g 6'6" (7' over fenders) 7'3"(*), 7'8"(*), (and 8'3"?) 4'3½" ? 3000g, excluding late Collett 6'6" (7' over fenders) 7'8"(*), 8'3" 4'3½"
Churchward 3500g 8'0" (8'6" over fenders) 8'6" 4'3½"
Collett 4000g 8'0" (8'6" over fenders) 8'8" 4'4½"
4000g slab-sided Hawksworth 8'0" 8'8" 4'4½" ? 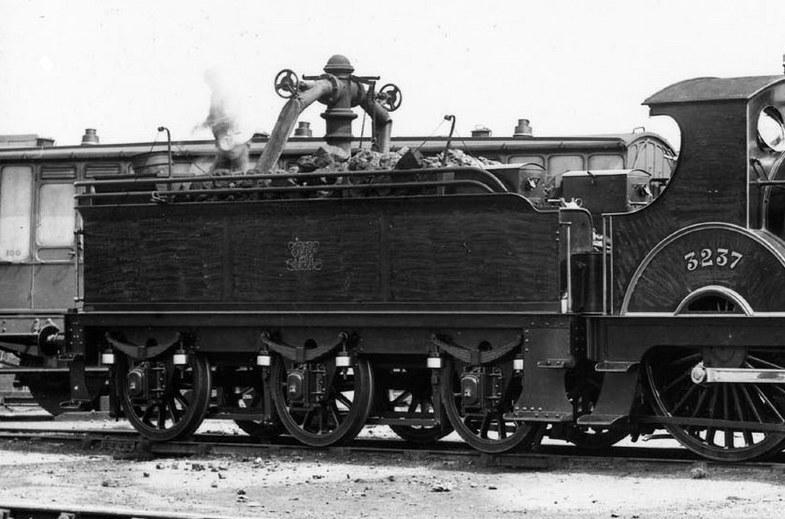 8'6", for Counties 9' 4' 5⅞"
In 1884 a single tender to a new 3000g design was built. This had the new feature of springs below the footplate. 396 more were built between 1890 and 1906 to basically similar designs, with various detail improvements in suspension, changes in fittings and so on. Such was Swindon economy of design that the principal dimensions of these tenders were still present in the Hawksworth 4000g tenders, 80 years later. Coal rails were introduced in the 1890s, the front of the body flare became unrecessed from lot A45 of 1900/1, and solid fenders were fitted from lot A54 of 1903. The nominal coal capacity was 5 tons. Approximate weights were 17.5 tons empty, 37 tons full. 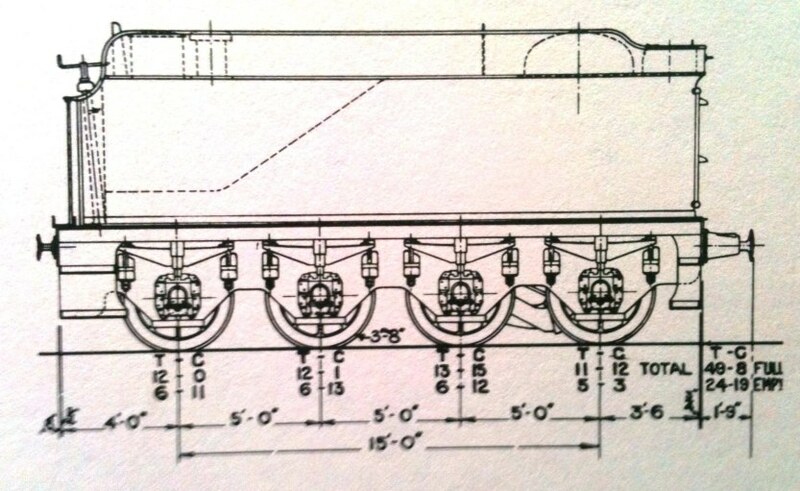 There were variations in shoveling plate height, handrail arrangements and the width of the tender platform to match different locomotives requirements. For the earliest 3000g units, the water filler was a small round fitting. Later, when scoops were being fitted, the water dome and the filler were combined in a single D-shaped 'coffin' casing. The domes and fillers were separated later on many of these tenders when they were renovated. The coal plate position was not changed however – an aperture was cut into the coal plate to accommodate the front of the dome. Vacuum tanks ('reservoirs', in official parlance) made an appearance in 1904 on the last four lots (A62, A63, A64 and A71) of 3000g tenders, to work with the initial 28xx 2-8-0s and 29xx Saints. These vacuum-fitted 3000g tenders were in turn passed to other classes, including Bird series Bulldogs, when the 28xxs and Saints started to upgrade to 3500g units, and could later be found usually behind Collett 2251 locos. Churchward transverse vacuum tanks could be seen on some 1936-style Collett chassis running under old Dean-style 3000g bodies. Light springs were initially fitted to the 3000g tenders, but most seem to have been changed to heavier springs by the late 1920s. The first was withdrawn in 1927, and 104 of this type were sold to the war department in 1940 associated with Dean Goods. However, there were still some in use in 1964 when the WR stopped keeping records of tenders. 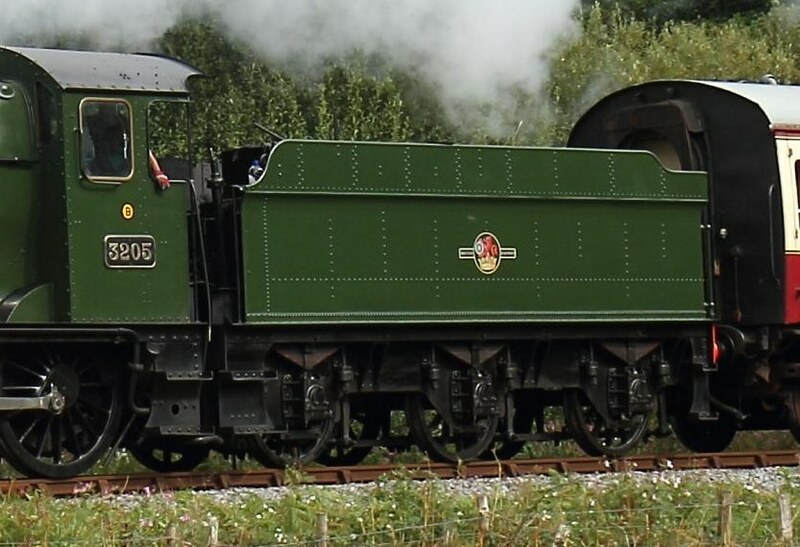 'City of Truro' is preserved with one of these tenders, fitted with coal fenders rather than coal rails, and with separate water filler and dome casings. Water scoops began to be fitted from the mid-1890s, with the first water troughs entering use in October 1895. The water scoop gear incorporates not only the actual scoop at the bottom, but also apparatus above the tank. The uprushing water hits a dome where it is spread out and falls back into the tank. Initially, the dome and the filler cap were combined in a single D-shaped 'coffin' casing. Water intake per yard of water trough was optimised when the train speed was approximately 45mph. It seems that scoops were fitted only on an 'as-required' basis at first, but were rapidly deployed on many tenders as the number of water troughs increased. Scoops seem to have become a default fitting for new-build tenders from late-1899 onward, but the extent and how quickly scoops began to be fitted to tenders built previously is unclear. To complicate matters further, for tenders receiving fenders after 1903, it seems the D-shaped coffin casings were also fitted regardless of whether scoops were intended to be fitted. Scoop gear under the bottom of the tank seems to have been removed on the 2000g and 2500g units at an early stage, but the scoop handles and scoop wayshafts usually remained in situ. 3000g units kept their scoop gear for longer, but most had their scoops removed in later years. 3500g and 4000g units retained their scoop gear. Adrian Vaughan has an excellent article on GWR water troughs. June 1909. 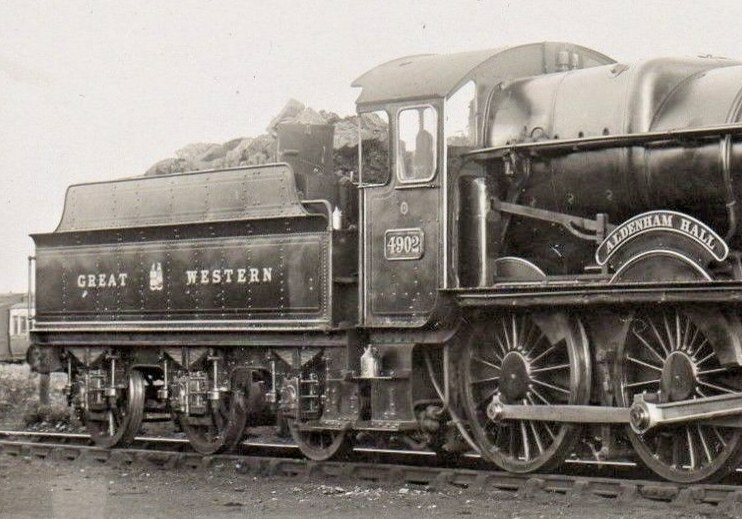 As the first loco of the class to have a new style of front end over the inside cylinders, and with its new No 3 superheater, it's understandable that Star 4021 has qualified for a works grey portrait, but it is strange that Churchward's most prestigious locos should be accompanied by unfitted Dean 3000g tenders without water scoops. Despite there being no new 3500g units readily available in 1909, a number of pictures from the era do show Stars running with such tenders, so this works grey portrait is not untypical, at least until enough new 3500g units became available. 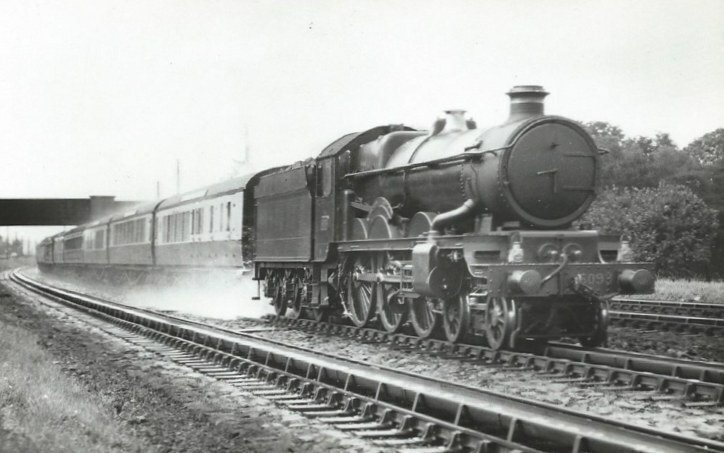 An early Dean 3000g tender in 1924, behind an overhauled Duke 3267 'Cornishman'. A water scoop is present, and the water filler and dome are combined (the lid is open here). 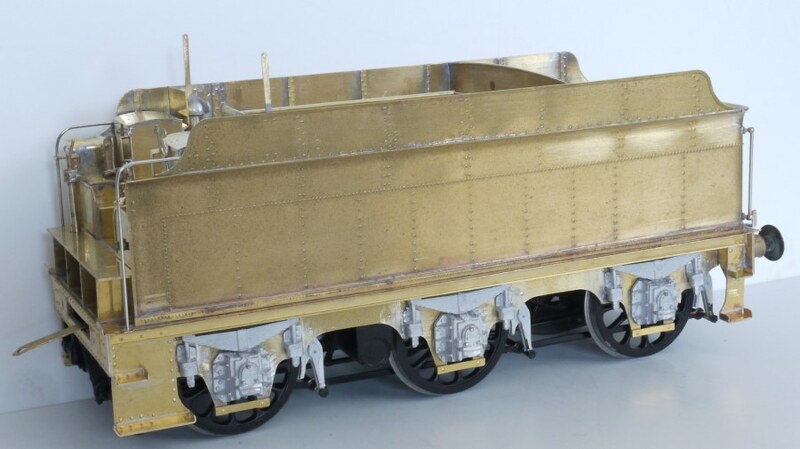 This tender has a standard 3000g platform width of 7'8" with added on pieces at the front to match the 8'3" footplate of the engine, and 'outrigger' handrails. The lower half of the front step is scalloped, and the front flare of the body is recessed, which matches the height of the cabside cutout. The springs are light. The bridles under the hornguides are the early rod type. 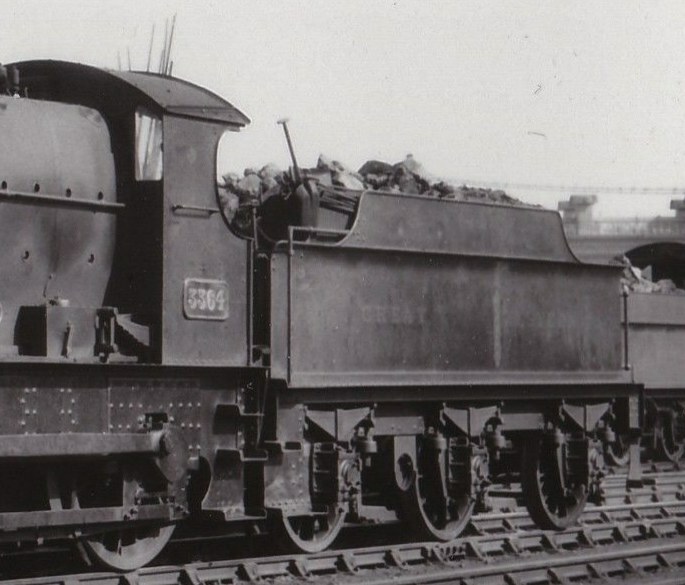 In the early 1920s, a standard 7'8" wide platform Dean 3000g tender with light springs and outrigger plates and handrails behind Badminton class 4110 'Mortimer'. Some of the Badmintons moved up to Churchward 3500g units in their last years. Collett Goods loco 2251 is new in 1930, but its refurbished 3000g tender originates from 30 years or so earlier. 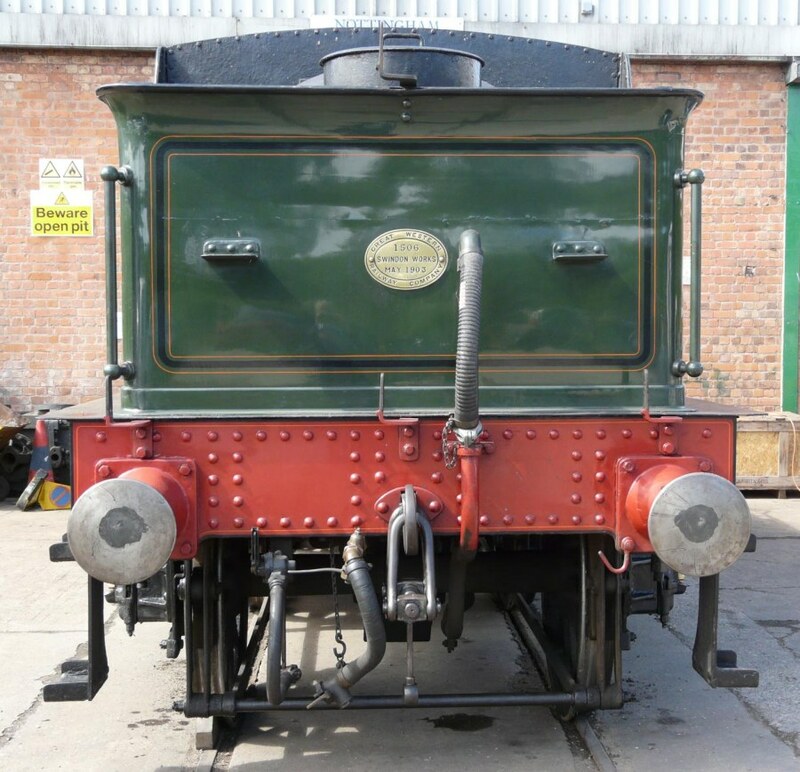 Separate water filler and dome, water scoop, standard platform width of 7'8" with added on pieces to match the 8'3" footplate of the engine, and 'outrigger' handrails. The lower half of the front step and the front of the body flare are in the later style. The springs are heavy, but the spring shackles are of an uncommon small diameter. Rod type hornguide bridles. Dean tapered buffers. 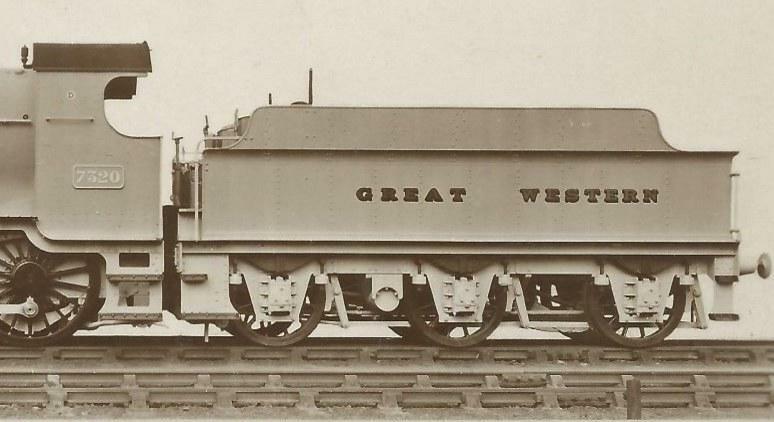 Most 3000g tenders running with 4-4-0s had outrigger plates fitted to align the tender's front handrails with those of the loco, but City of Truro's tender (no 1506, of lot A49) was of a batch where the tender platform was wider than normal, at approx 8'3", throughout the length of the tender, and which matched the 8'3" width of the loco footplate. The smaller-capacity 8'3" wideplate tenders became somewhat elusive after the big-wheeled 4-4-0s started to upgrade to 3500g tenders after the mid-1920s, but here is one at Didcot in 1948 behind Duke 9083, working the DN&S line at the time. The wideplate platform transforms the appearance, and makes determination of whether the tender is a 2500g or a 3000g difficult. The tender's handrails have been changed to be 'inline' to match with those on the narrow cab of the loco. The tender has an unusually tall toolbox. 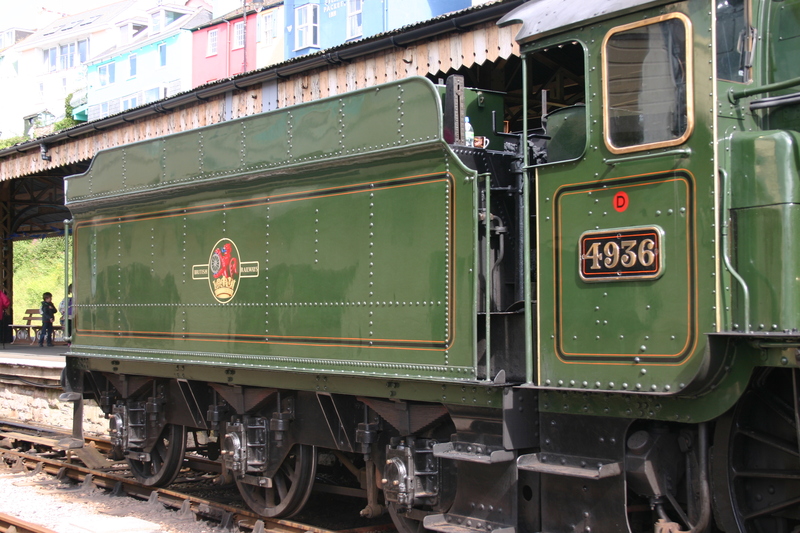 The loco was one of the last two Dukes to survive, and was withdrawn in December 1950. Photo by Ben Brooksbank, and reproduced under Creative Commons Licence. Another of the 8'3" wide platform 3000g tenders finds itself paired with Collett Goods 3212, seen here entering Winchester Chesil on a Didcot to Southampton train. 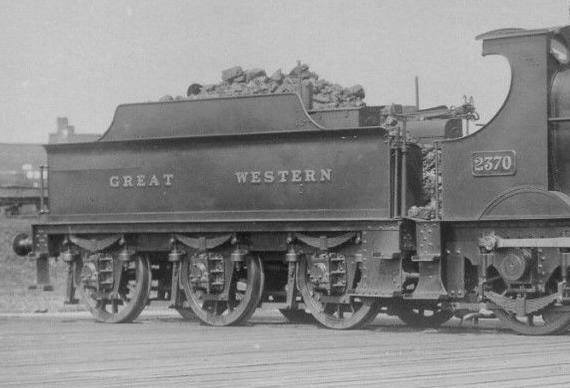 Rear view of City of Truro's tender, showing the 8'3" wideplate platform. The lampirons are mounted on the bufferbeam, and are painted 'half-red and half black'. The left-most pipe is a modern addition – an airpipe fitted in case of main line failure and recovery by an air-braked loco. Picture courtesy Brian Hunt. Running behind Collett Goods 2272, this Dean 3000g has acquired a 1936-pattern Collett underframe with wide-angle hornguides and curved between the hornguide and the horiontal part of the frame. There is no water scoop and no vacuum tank. Pictured at Camarthen, probably late-1930s. Thanks to Mike Morant for permission to show this, the full version of which can be seen here. 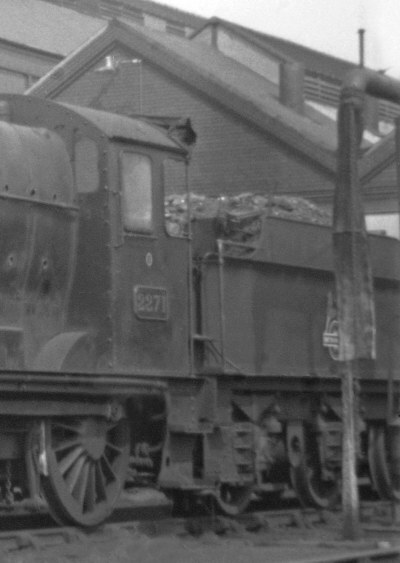 The number of Dean/Churchward vacuum-fitted 3000g tenders was comparatively small, and are elusive, but here is one on what seems to be its original frame behind Collett Goods 2271 at Camarthen on 11 April 1953. Photo extract courtesy Rail-Online. Most Collett Goods engines spent their later days running with Collett 3000g tenders. 2500g tenders had a 6'6" + 6'6" wheelbase, and 301 were built between 1884 and 1903. 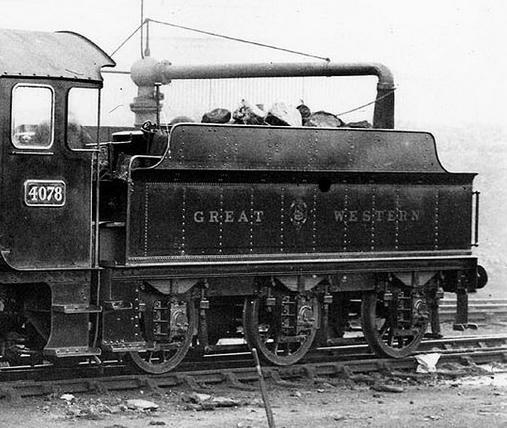 Often used with 0-6-0s, many went overseas in the Great War, and three were sold to the war department in 1940. In time, they received coal rails and fenders like the 3000g units. They had a nominal coal capacity of 4½ tons. Approximate weights were 16 tons empty, 34 tons full. The earliest 2500g units had round fillers. When scoops were fitted, the water dome and the filler cap were combined in a single D-shaped 'coffin' casing. A few tenders had separate domes and fillers when they were later renovated. The coal plate position was not changed however – an aperture was cut into the coal plate to accommodate the front of the dome. It seems 2500g tenders always kept their light springs. No 2500g tenders were fitted with vacuum tanks. Withdrawals started from 1927. 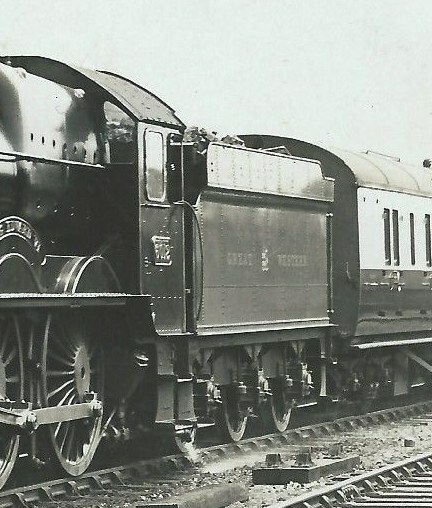 Most 2500g tenders had disappeared by the end of WWII, but a few survived into the 1950s, with two known to have received BR(W) black livery, 2449 and 2538. 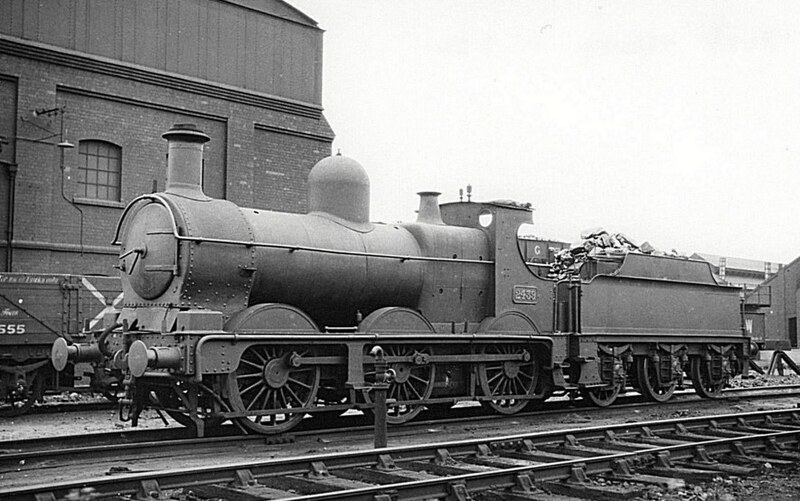 One (number 1273, of lot A33) is preserved with Dean Goods 2516 at Steam Swindon, fitted with fenders, but retaining its initial combined casing for the filler and scoop dome. 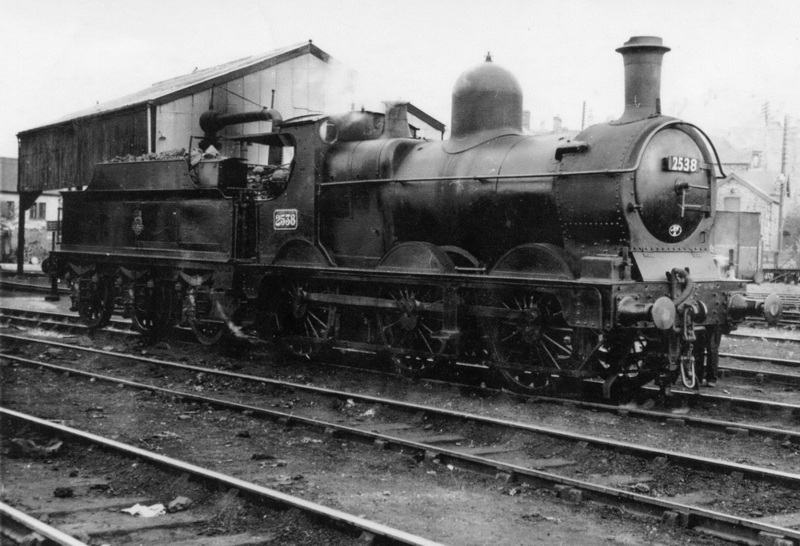 Late-pattern 2500g tender behind 2361 class 0-6-0. Unrecessed body flare fronts on the Dean 2500g first appeared with lot A36 of 1899. No scoop seems to be present. Early-pattern Dean 2500g tender behind Dean Goods 2467 at Weymouth, probably shortly after 1905, showing the 'twin-strips' style of brake hangars fitted to all Dean and Churchward tenders. A scoop is fitted. Note the lining follows the recess of the front body flare. Blanking plates fitted behind the coal rails of 2500g tender, c 1907, behind Bulldog 3445 'Ilfracombe', later renumbered 3383 after 1912. The fire irons are stowed rather dangerously, and a fireiron tray will probably not be fitted until the coal rails are replaced by fenders. The tender is a narrowplate one, with outrigger handrails and outrigger plates to match the loco cab. No scoop seems to be present. Early-pattern Dean 2500g tender with a recessed front bodyflare is a perfect height match for the loco cab cutout on Dean Goods 2439, and the 7'8" tender platform width is just right for the later (wide-footplate) Dean Goods locos. 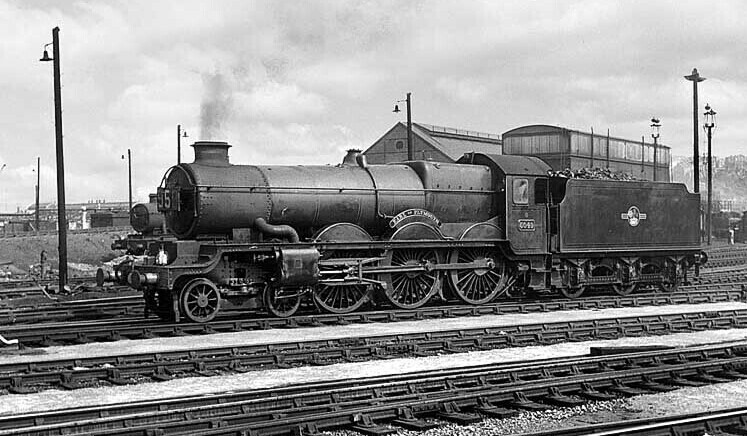 Tyseley, 15 July 1934. Some 80 short tenders with 5'6" + 5'6" wheelbase were built from 1895 to 1901, initially 2000g capacity and later 2400g. 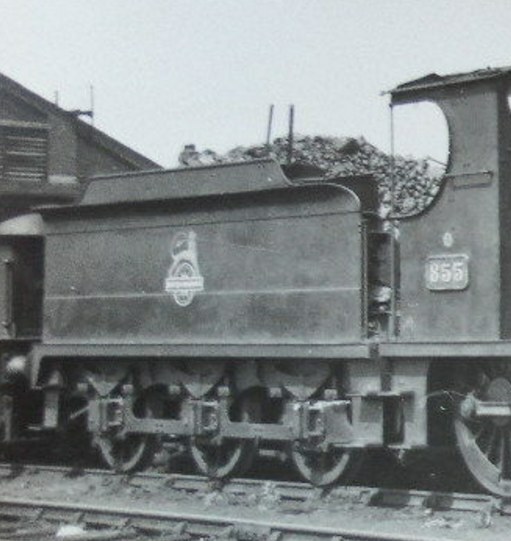 The short wheelbase of the 2000g tenders, built primarily for use with the Duke locos, was predicated on the lack of a larger turntable at Penzance until Long Rock loco shed came on stream c 1914. None of these short-wheelbase tenders have survived. 2000g tenders always kept their light springs. 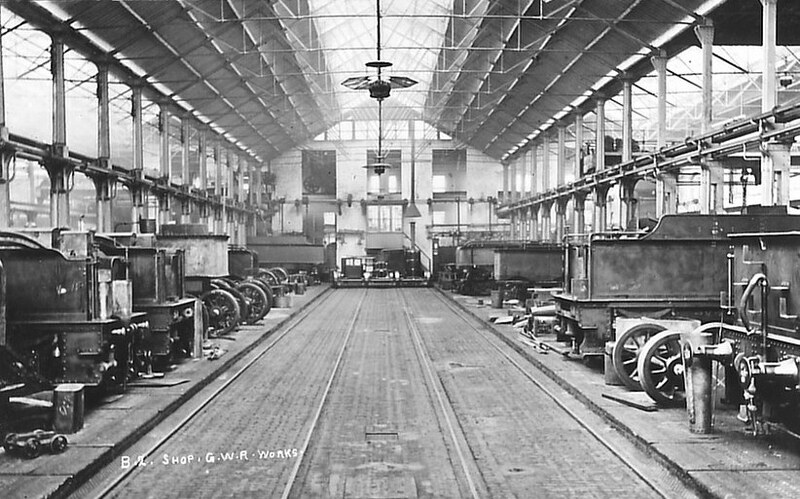 No 2000g tenders were fitted with vacuum tanks. 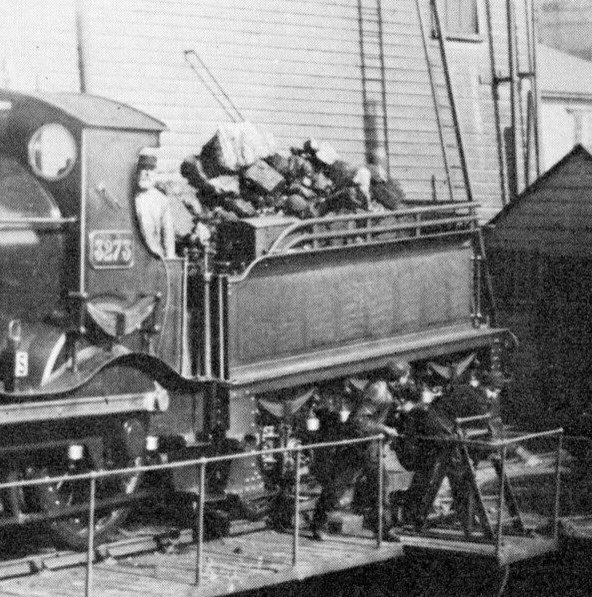 Even with its short wheelbase, a 2000g tender has to be squeezed onto a set of outriders at the short turntable at Penzance station, c 1898. 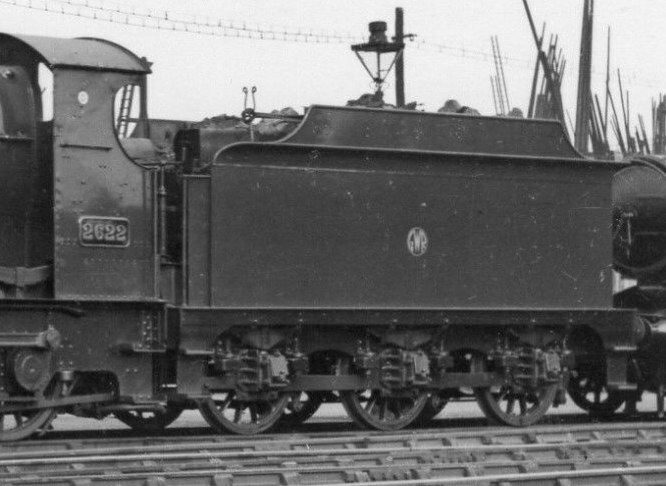 The loco is Duke 3273 'Armorel', later rebuilt as a curved-frame Bulldog. Dean 2000g tender updated with coal fenders and water scoop. This would be typical for post WW1. 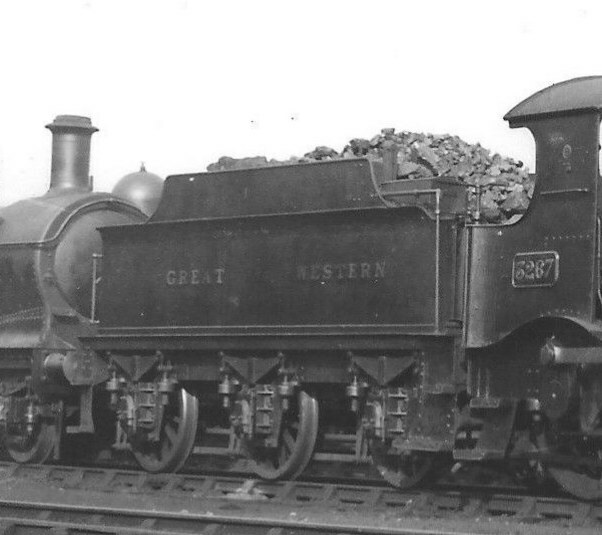 In pre-1906 condition with the early monogram, a 2000g tender behind 'Stella' 2-4-0 3510. No scoop is present. Like most of the 2000g tenders at the end of their lives, this one appears to have lost its water scoop. 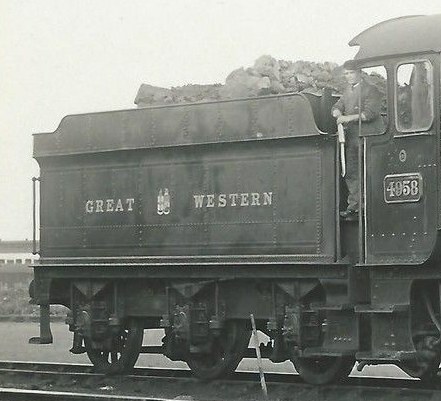 2000g tender behind Dean Goods 2434 at Pontypool, thought to be in 1935, and possibly one of the last 2000g tenders in service. It's platform width is a good match for the footplate width (7'8") of the later Dean Goods locos, and the front handrails are short ones inline with the tender body. These are often called Churchward or Collett tenders. However since the Churchward designs were still being built some years after Churchward retired the label is potentially confusing. Tenders from this era get a little complicated. The source of problems isn't so much that the designs changed radically, in fact rather the opposite. There was continuous background development that was going on through the lifespan of these tenders and a policy of fixing what needed fixing, and not fixing what was still serviceable. And, rather like the 4-4-0s at the turn of the century, it seems the frames weren't really strong enough, so between 1925 and 1948 there several significantly different treatments of the area round the horn plates and spring hangers. When a tender had major repairs the chassis and water tank might be separated and recombined with earlier or later units. Almost all tenders of this era had the 7'6" + 7'6" wheelbase used on the 3000g Dean tenders. From 1910, the combined 'coffin style' filler and dome gave way to a formal separation of the water filler and water dome, the latter being a highly flattened hemisphere. There was an earlier interim 'hybrid' stage however introduced in 1908 for the Churchward 3500g units, and probably only on lot A78, where the filler was extended to make an elaborately shaped cover onto the dome. Up to 1926 the tender water tanks had a well tank between the frames, and consequently the water tank above the frames was relatively shallow. From 1926 onwards the well tank was abandoned, and tenders had a simple flat-bottomed tank above the frames, which consequently was somewhat higher. The elimination of well tanks enabled several different tank designs to fit different underframes, the idea being that if the tank needed any repairs, once the frames, running gear etc had been overhauled, then the next repaired tank in the pool could be fitted. 3000g tenders were lower than 3500g tenders, and 3500g tenders lower than 4000g ones. In addition, when the well tanks were abandoned the sides of the tenders got higher too. There was also a rare variant of 3500g well-tank tender with sides some 4" higher than standard which seems to have been produced in the 1920s and originally fitted to Castles until they received 4000g tenders 2. Coal rails, fitted at the very beginning of this period, were soon replaced with short coal fenders about 15' long. The fenders were lengthened to about 18' long on the Churchward 3500g units from 1910 (lot A79) onward. 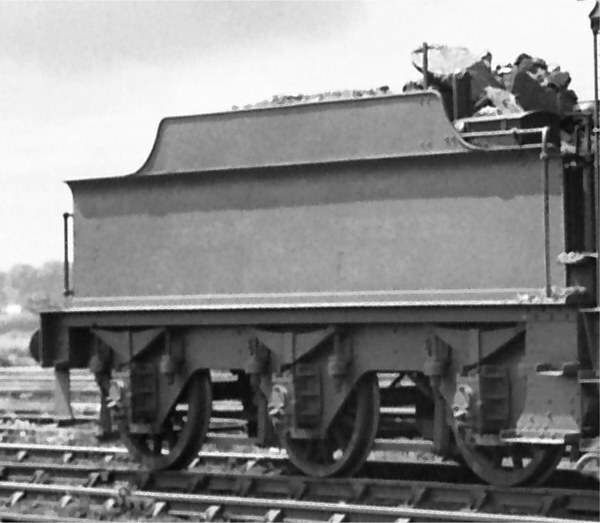 After 1926, the tenders with no well tank had the coal fender continuing round the back of the tender at a lower level, not simply truncated after the coal space. Tank vents, not fitted initially on early Dean tenders, became a standard fitting, although when these first appeared on new build is not known (probably c 1900). Water gauges and fire-iron trays were introduced, and became standard features. (Fire-iron trays probably appeared when fenders were fitted.) Toolboxes were initially identical on both sides, but a different pattern toolbox on the left-hand side was fitted later. At first the chassis was very similar to the Dean ones, quite shallow and with conventional sized horn plates. A few tenders in the mid-1920s had a deeper chassis in the region of the spring hangers, but the frame was then scalloped upwards to roughly the same depth as its predecessors. This two-stage curve was reminiscent of spring arrangements on several outside frame classes. From 1926, the scalloping was omitted and the frames were straight between the spring hangers, so somewhat deeper. From 1931 the horn plates on the frames were much wider at their base 3. 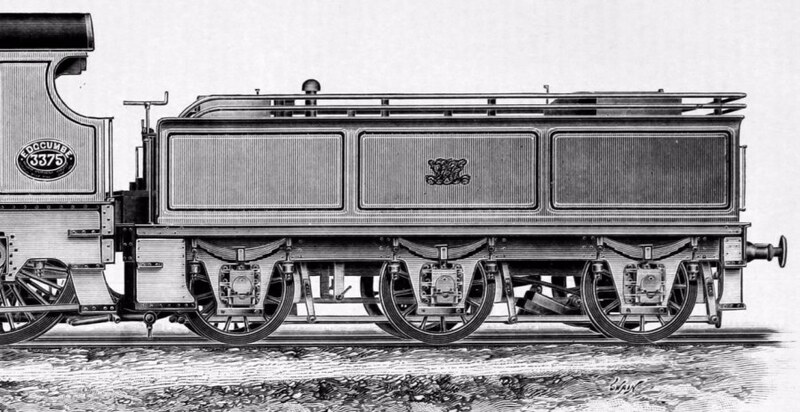 Collett's team did some significant work on spring design for tenders as well as locomotives. The later springs had more and flatter leaves, without the curvature of earlier types. To complicate things further it was by no means uncommon for older tenders to be uprated with later design springs. There were several designs of spring hanger, both to cope with varying designs of spring and chassis and to provide reinforcements to older tenders. The weakness in the corners near the axle boxes due to stress concentration caused cracks to form. In particular there was a distinctive style in which rectangular plates with generous flanges were used to reinforce the horn guides and support later style flat springs. 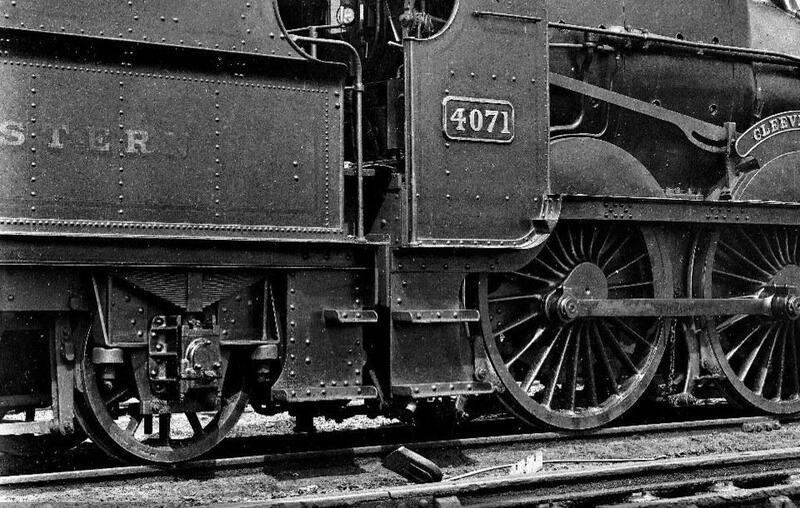 4901 was the first production batch Hall, and this works grey portrait shows its tender, a Churchward 3500g with snaphead riveted body, with flanged plates securing the spring hangars. Photo probably taken in 1928. Flanged plates on the spring hangars of this Churchward 3500g unit behind 4071 'Cleeve Abbey'. These plates helped absorb bending stresses set up by the springing. Flanged plates on the spring hangars on a very rare hybrid of a late Dean 3000g top on a modified Churchward underframe, behind Bulldog 3369 'David Mac Iver', late 1920s. Early tenders were steam-braked. It is thought that no 2000g or 2500g were ever fitted with vacuum brakes. 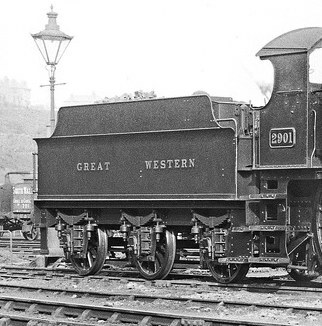 Dean-era 3000g tenders were not fitted with vacuum brakes until the last few of 1904, which were designed to work with the first 28xx and 29xx locos. It is possible and even probable that more Dean-era 3000g underframes were altered to vacuum-fitting in their later years, and some Dean tops running with later Collett underframes did have vacuum tanks. In 1906, commencing with the first 3500g tenders, vacuum brakes were fitted as standard. Vacuum tanks were initially fitted longitudinally, but a transverse orientation became the later standard. On Collett designs (3000g, 3500g and 4000g), the vacuum tanks were longitudinally mounted, but set up within the frames, and not generally visible in a side view. On the later Hawksworths, the vacuum tank was transverse mounted across the frames. Vacuum brake cylinders were under the shoveling plate, in front of the front axle, but also not visible in general view. Brake hangars were of the 'twin-strip' form on early tenders, but were changed to the later Collett cast style, probably post-1930. Brake hangars on older tenders were often replaced with the cast ones when repairs and upgrades were made. 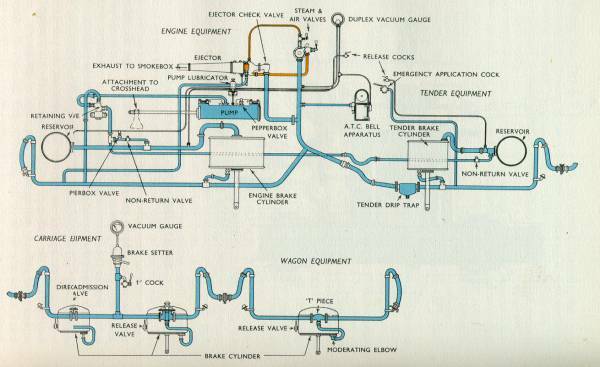 The plumbing of vacuum apparatus linking loco, tender, carriage and wagon. Image courtesy of Gavin Bishop, of the South Devon Railway. 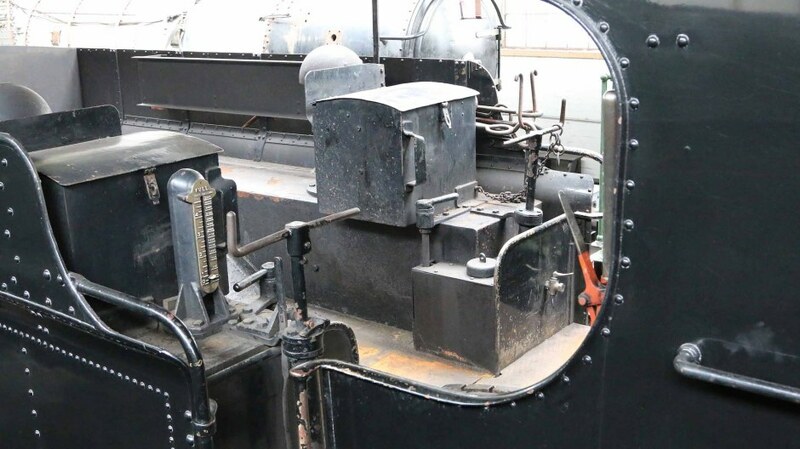 When the brake is applied, a valve on the loco called the 'retaining valve' changes over the action of the vacuum pump to keep the reservoir topped up, which prevents brake fade and the reservoir vacuum dropping with time on a long brake application. 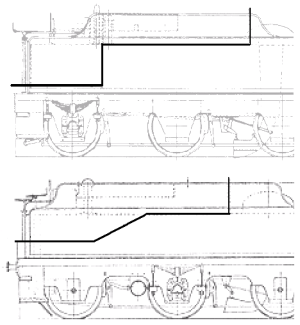 It seems that all the Dean-Churchward 3000g units and the early Churchward 3500g units had coal spaces with a vertical rear wall. At some unknown date in the Churchward era, possibly 1912, a slope was introduced to new-build tenders. See the indicative sketches adjacent. 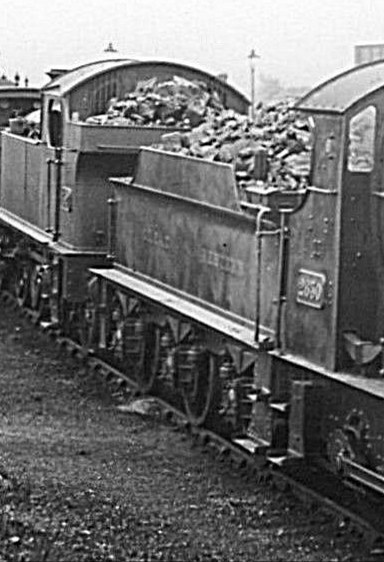 Later Collett tenders had sloping sides to the coal space as well. Dean 3000g and Churchward 3500g tenders outside Swindon works, probably awaiting locos coming out of A shop. Date unknown, but possibly c 1912. The ownership of this picture is unknown; it appeared in The 4mm Engine: A Scratchbuilder's Guide by the late Guy Williams, with the source attributed to 'British Railways', and is probably from his collection or the collection of Pendon Museum. 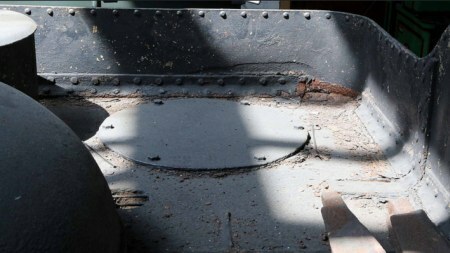 On the 2500g, it seems that the position of the rear coal plate was not moved when domes were fitted in later renovation, and an aperture was cut in the plate to accommodate the front of the water dome. A similar situation applied to the early 3000g units. 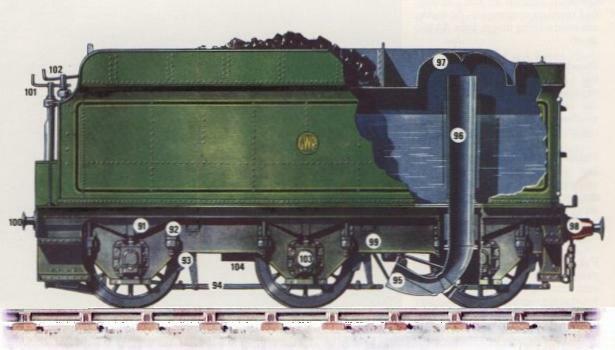 On some later weight diagrams for some 3000g units however, the rear coal plate is shown moved forward to be clear of the water dome. It is not known when the coal plates started to be re-positioned, or why they were repositioned, and there seems to be some doubt whether those weight diagrams are authentic. 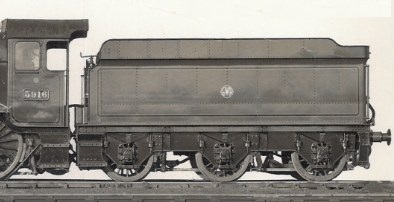 Early Churchward 3500g units had coal plates in the rear position, with apertures cut to accomodate domes when these were fitted. 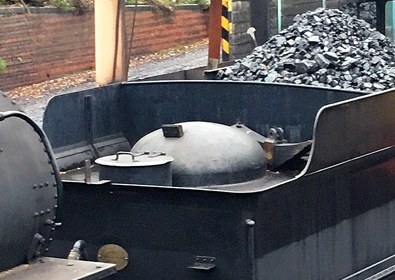 The coal plate was moved to the forward position c 1908, probably from lot A78 onward, to make space for the hybrid filler and, later, the separate dome and water filler. 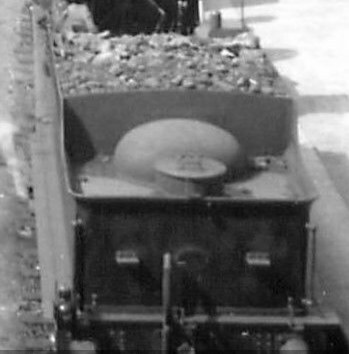 All Collett tenders had coal plates in the forward position. 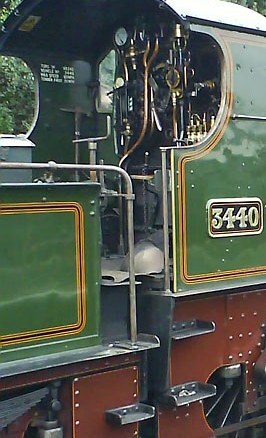 City of Truro's tender, showing how the rear coal plate encroaches slightly on the front perimeter of the water dome. CoT's tender was initially built with a combined 'coffin' style cover for the water dome and filler, so its current state reflects a refurbishment carried out at some time during GWR days. 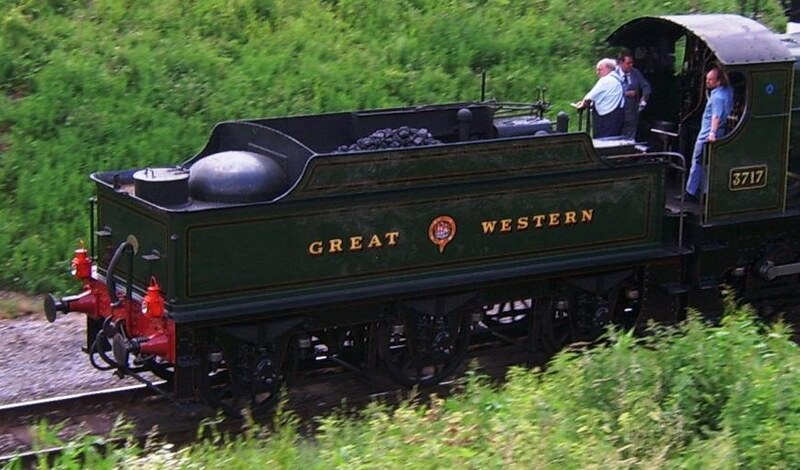 Pictured on the Gloucester & Warwickshire Railway, 2010, picture courtesy of Neil Hibbins. The unique 8-wheeled bogie tender, number 1755, built in 1908 under lot A76 for use with loco 111 'The Great Bear'. 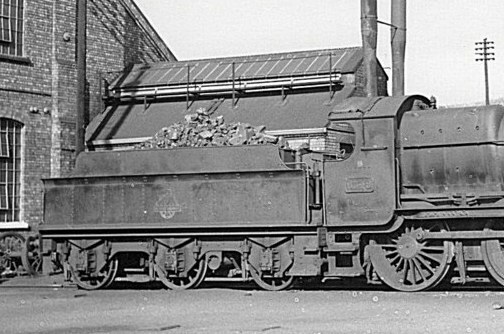 It had a 3500g capacity, a wheelbase of 5'9" + 4'6" + 5'9", with 3'2" wheels, and its water scoop and dome was located between the two bogies, which made the coal space a peculiar shape. 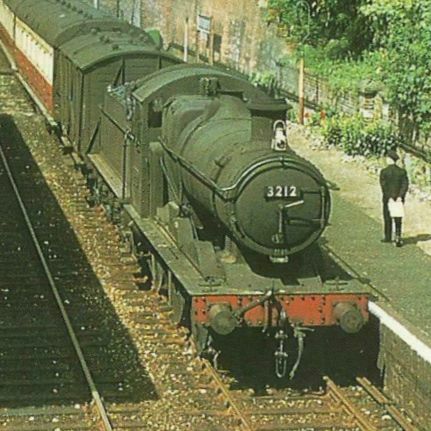 After 111 had been withdrawn (it was rebuilt into a Castle), the tender saw use with some 4-4-0 Counties and, later, Saints, as here with 2912 at Exeter. It lasted until 1940. 629 3500g tenders with the early shallow frame style were built between 1905 and 1925. All were basically the same design, but the initial batches had fairly short coal fenders, which were replaced with a longer design from 1910. 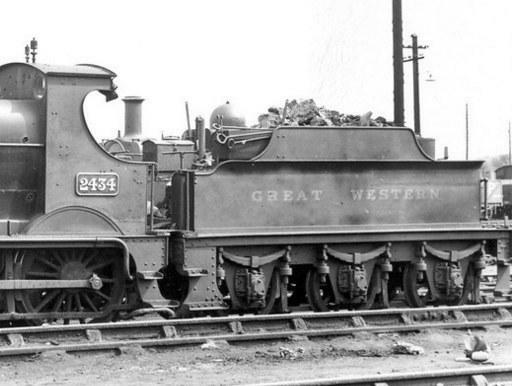 Although most were built at Swindon, 35 were constructed by Robert Stephenson & Co with the 4300 2-6-0s they built. They were sometimes fitted with stronger post-1925 frames in later life. Some also acquired different designs of water tank. Early lots had light springs, but most were fitted with heavy springs, with the earlier units being later upgraded to heavy springs. Early bodies were flush-riveted, later bodies (from about the end of 1917) had snapheads. Tank vents became larger about 1911. The early form of transverse vacuum tank was changed to a small longitudinal tank from about 1911 (possibly lot A82). From the mid-1920s, the vacuum tank became transverse in its late-standard position. Nominal coal capacity was 7 tons. Approximate weights were 18 tons empty, 40 tons full. A good number of these tenders have survived into preservation, at least one of which has replacement Collett era frames. Water tanks are naturally very vulnerable to corrosion, and quite a number of these tenders have had new or partially new tanks and bodies, not all of which are the original design or capacity. A batch of ten with the scallop frame style was built in 1925/6, and then a batch with the first of the deep style frames was built in 1929/30. One of the scalloped frame 3500g tenders has survived, but none of the later ones. County 4-4-0 3818 with a short-fender Churchward 3500g, in 1906, with light springs and an early form of transverse vacuum tank placed near to the front axle. 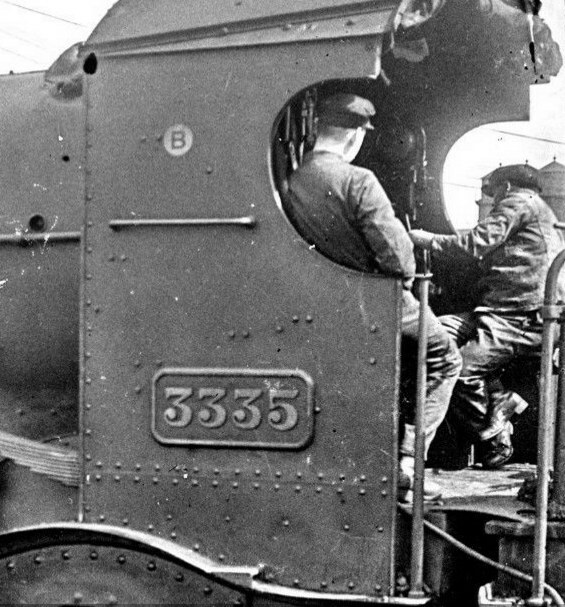 The loco is from the second batch (3801–20) of the class, fitted with vacuum brake. 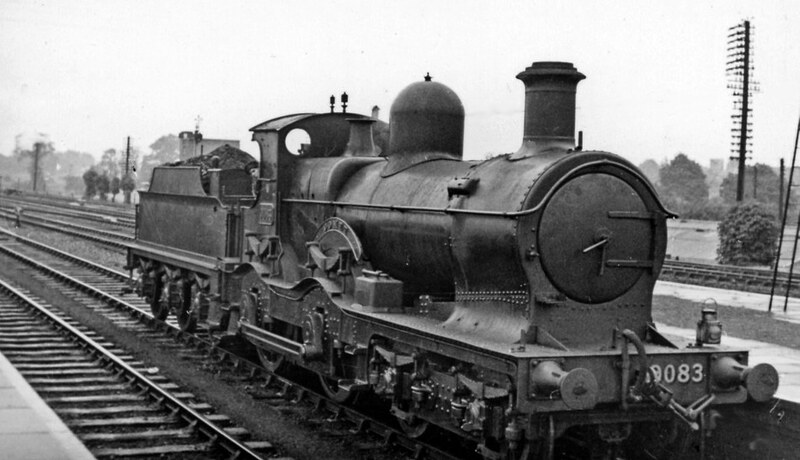 The first 1904 batch of locos (3800 and 3831–9) were initially steam-braked and had 3000g units, later fitted with longitudinal vacuum tanks. 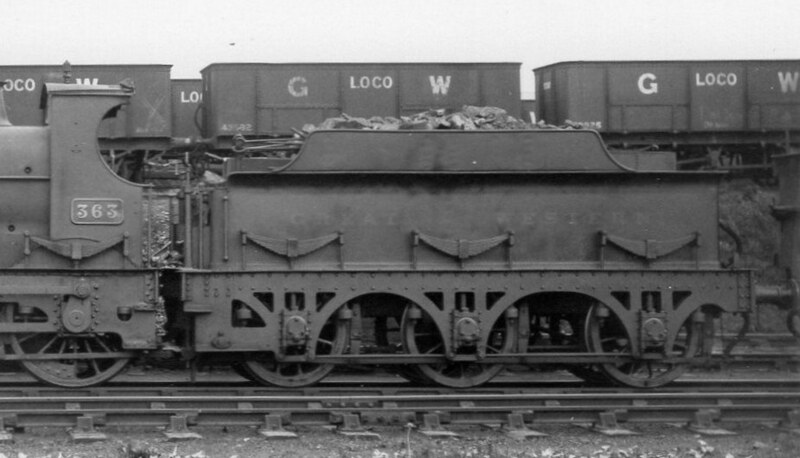 The last batch of locos (3821–30, of 1911–12) received Churchward 3500g units, when long fenders had become the norm. The shoveling plate of these tenders was set very high to match the loco cab floor. Note the perfect step alignment between loco and tender. Short-fender Churchward 3500g with a coffin-style filler and early form of vacuum tank, behind Star 4002. 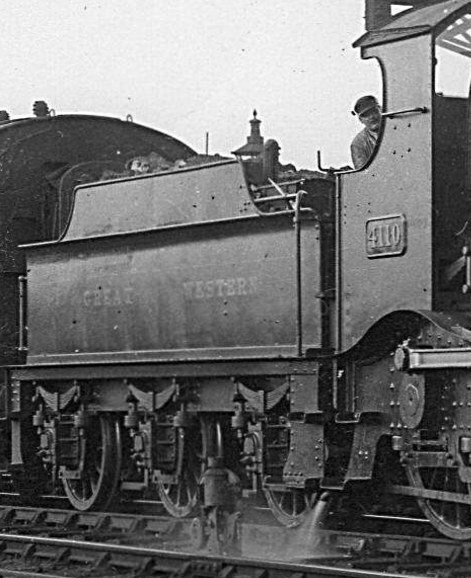 An early 3500g with short fenders, flush-riveted body, light springs and the first form of transverse vacuum tank, behind Star 4017 at Bath, September 1908. The water filler is extended to form an elaborately shaped cover onto the water dome. These specially-shaped covers seemed to vary in height, as can be seen in this much later picture of 4706 (on an ex-Dean 4000g). This type of cover was a short-lived interim style, typically found on tenders running with the first Stars. The dome and filler were separated on later-build 3500g tenders from 1910. It is rare to see a 3500g tender without a scoop, and even stranger to see the absence of a scoop handle. 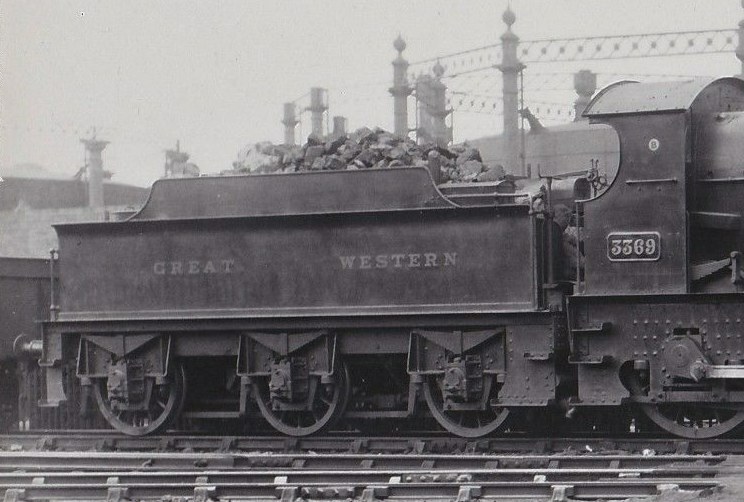 This is an otherwise standard flush-riveted early Churchward 3500g with light springs, behind Saint 2901 'Saint Superior' at Worcester, c 1922. The tender is unlined. 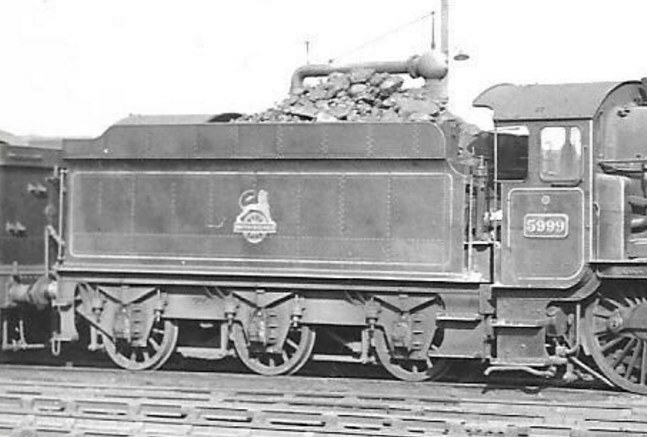 Pictured in 1911, a flush-riveted Churchward 3500g with light springs and a longitudinal vacuum tank behind 3821, the first of the last batch of 4-4-0 Counties. 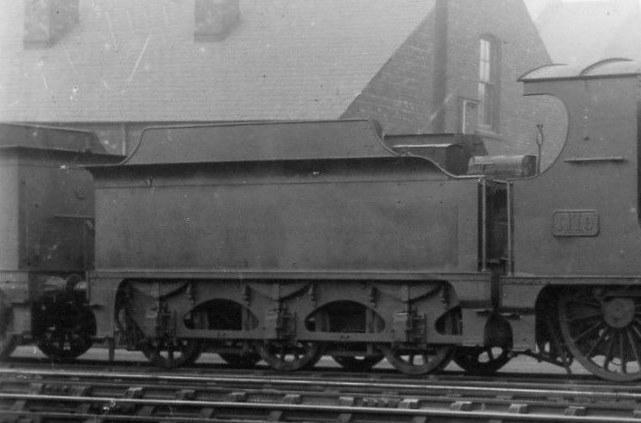 Churchward 3500g tender with longitudinal vacuum tank and flush-riveted body, c 1919. Heavy springs, tapered buffers and increased diameter spring shackles. 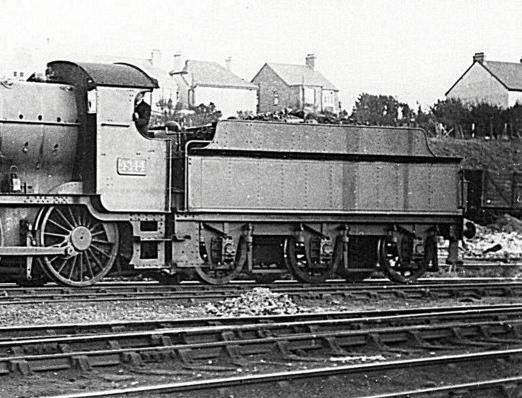 Most of the first three lots of Castles (4073–5012) received 3500g Churchward units, probably all of them with longitudinal vacuum tanks like this one behind 4078, pictured soon after building in 1923. Snaphead riveting for the body had now become the norm, although the works grey portrait of 4073 'Caerphilly Castle' shows a flush-riveted one. The early 'low, straight-arm' water cranes would be a cause of clearance trouble when the Collett 4000g tenders appeared later. 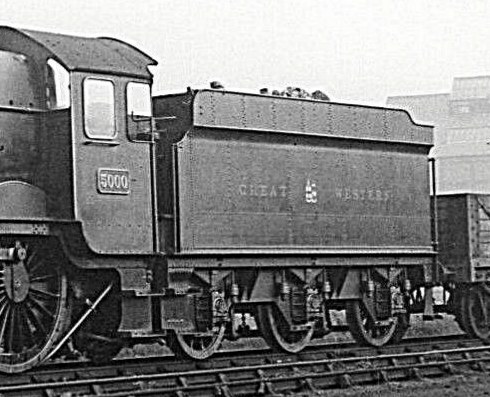 Standard late Churchward 3500g tender in a works grey portrait with Mogul 7320, c 1925. Snaphead rivets on body, transverse vacuum tank. Heavy springs, tapered buffers. 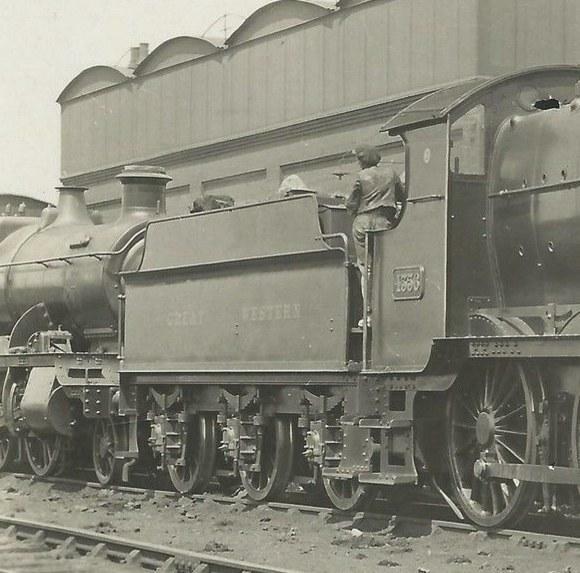 Pictured probably at some time between 1930 and 1933, Hall 4923's tender is a flush-riveted Churchward 3500g with a longitudinal vacuum tank. Flush-riveted Churchward 3500g behind Collett Goods 2241 in late BR(W) lined green livery. Heavy springs, Collett parallel buffers. Cardiff Canton, 15 March 1961. Tony Geary's 7mm model of an 'intermediate' 3500g tender, about to go into the Martyn Welch paintshop. This design was a small batch of ten built in 1925 under lot A112, and can be spotted by the line of rivets two-thirds up the body side. Picture courtesy Tony Geary. These intermediate tenders ran with a variety of locos, see for example running with 4936 Kinlet Hall. 3500g intermediate tender running with 7828 'Odney Manor'. Collett 3500g tender. A small number (27) of these were built in 1930, and had continuous fenders extending around the rear. Their height matched well with the cab cutout height of 4-6-0s. (These tenders were 6" higher than the later Collett 3000g units.) They had deep frames and narrow horn plates, but there were variations in spring shackle length between different lots. Approximate weights were 22 tons empty, 45 tons full. Click here for a GA drawing of lot A118. Hall 4958 and a Collett 3500g with long spring shackles in the early 1930s. 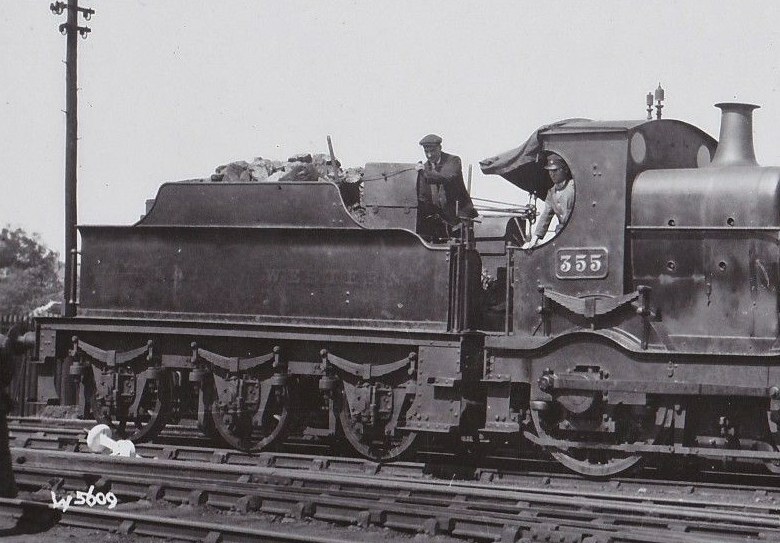 Collett 3500g tender with short spring shackles running behind Saint 2935, probably shortly before WWII. The loco still has small boss drivers on its leading and trailing axles. At the turn of the 20th century, the GWR was seeking ways to increase passenger revenue by instigating long-distance non-stop trains. During the time the water trough network was being rolled out, some 4000gal tenders were made. The first of the 4000g tenders was turned out with Churchward 4-6-0 No 100, and had coal rails. Built between 1900 and 1904, these tenders had 8' wide bodies, 18" wider than the normal width prevailing at the time. The body height was also slightly higher compared to contemporary tenders. The last three had fenders from new, and initially used with locos 97, 98 and 171. Only 20 were built in all, and they were usually used with Atbaras, Cities and, later, Stars. The water trough network curtailed the need for more of these large capacity tenders, and they became normal pool units. They were rebuilt with lengthened fenders and newer stronger frames, and under Collett, most had the wells removed making them a lower capacity, in order to make the frames interchangable. At least one was rebuilt with Collett frames in later life. Some ended up looking similar to the Churchward 3500g intermediates. Some survived until the 1960s, but none have been preserved. Here's one in later years behind Aberdare 2639. Loco 102 'La France', delivered in October 1903, is one of the de Glehn Atlantics, and hauled the inaugural down Cornish Riviera Express from Paddington non-stop to Plymouth on 1 July 1904. 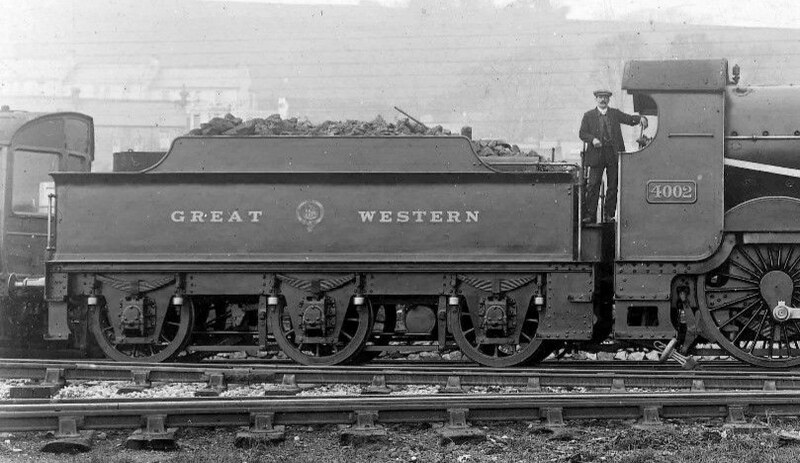 It is shown here, with a Dean 4000g with fenders, in its short-lived initial livery of black with red lining, and was repainted to standard GWR express passenger livery in 1905. 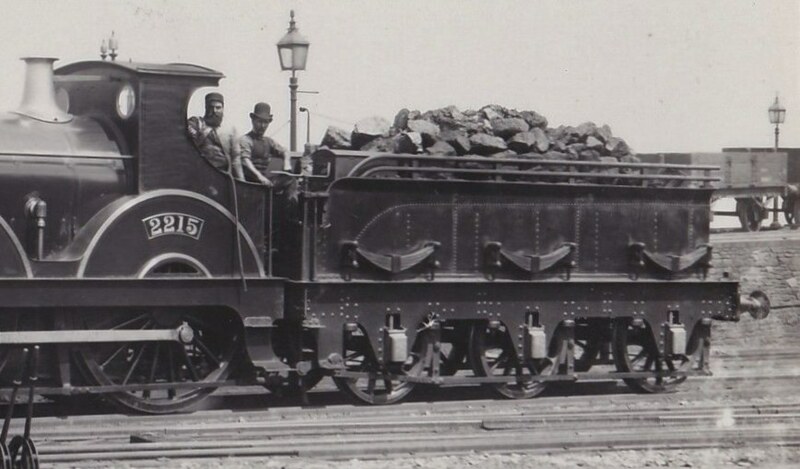 A Dean 4000g behind Atbara class 3387 'Roberts', c 1909 (later renumbered 4133 in 1912). Handrails on these tenders were later modified to be of a standard 'L' shape. No more 4000g tenders were built until 1926, but they then became the predominant type, and some 481 tenders were built between 1926 and 1946. The large 4-6-0 locomotives were almost all given 4000g tenders, and, for example, during the war 2884 2-8-0s were nominally constructed with 4000g tenders that were actually used with Castles, Stars and Halls, and the 2-8-0s left the works with second-hand 3500g units. One 8-wheel 4000g tender, number 2586, was built as an experiment in August 1931 to see whether there was a need for tenders with a larger capacity and because axlebox wear was quite high on the 3-axle 4000g units. In the event, the GWR considered its water trough network was adequate for the existing 4000g units. 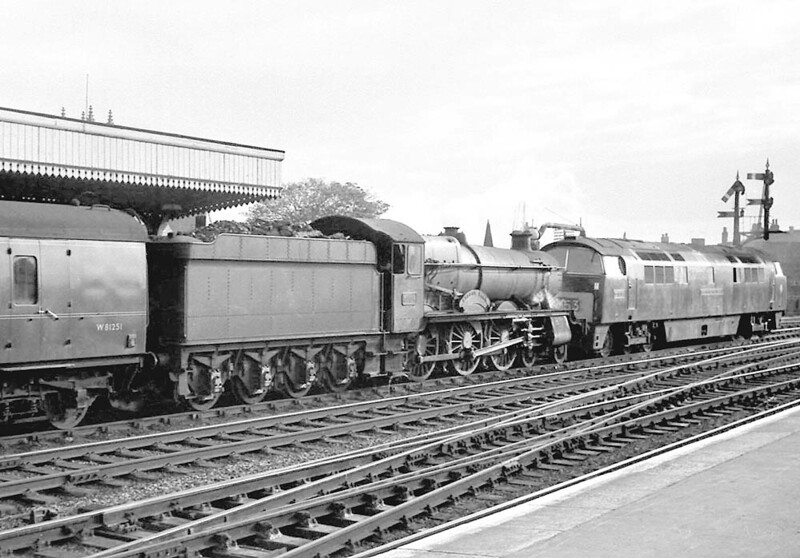 It ran behind a number of Halls, Stars and Castles 4, and pictured here with Hall 5904 in late steam days. Another experiment was an aluminium alloy tank. 17 of these tenders were temporarily converted to carry oil fuel rather than coal in the 1946 experiments. A good number of these tenders have survived into preservation and they are the most numerous type. A number of the earlier ones have had their original frames replaced with the later design during their service life. Many tanks have been replaced in preservation, and again not all are the original design or size. Nominal coal capacity was 6 tons, and approximate weights were 22.5 tons empty, 47 tons full. Collett 4000g tender. This is a post-1934 design frame with the wide hornplates, and as shown below behind Hall 5916. Wide hornplates first made an appearance c 1932 (on lot A127 onwards). 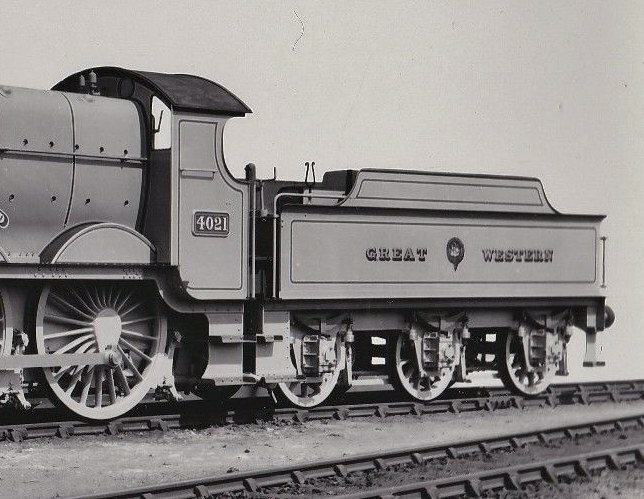 Castles began to receive Collett 4000g tenders as soon as they became available (after 1926), with the 3500g tenders of the early engines being passed on to other classes. 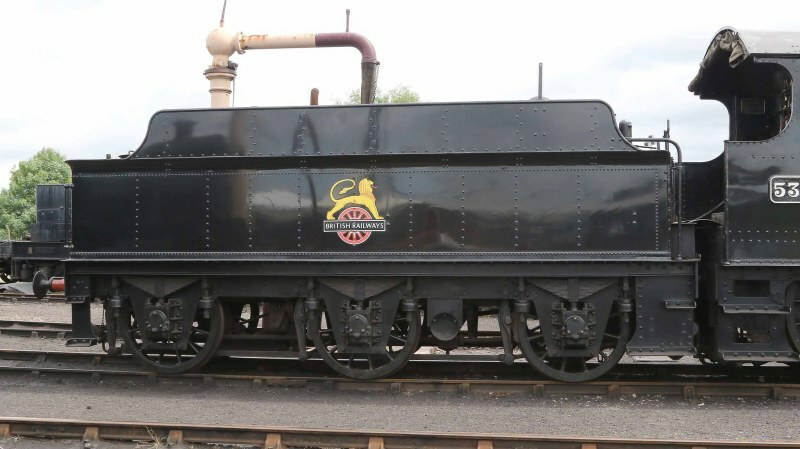 Here is 4073 Caerphilly Castle's first early-pattern 4000g tender, with narrow hornplates, long spring hangers and shallow gusset brackets between the frame and the body. The spring shackles are very thin, and would quickly be replaced by thicker ones. 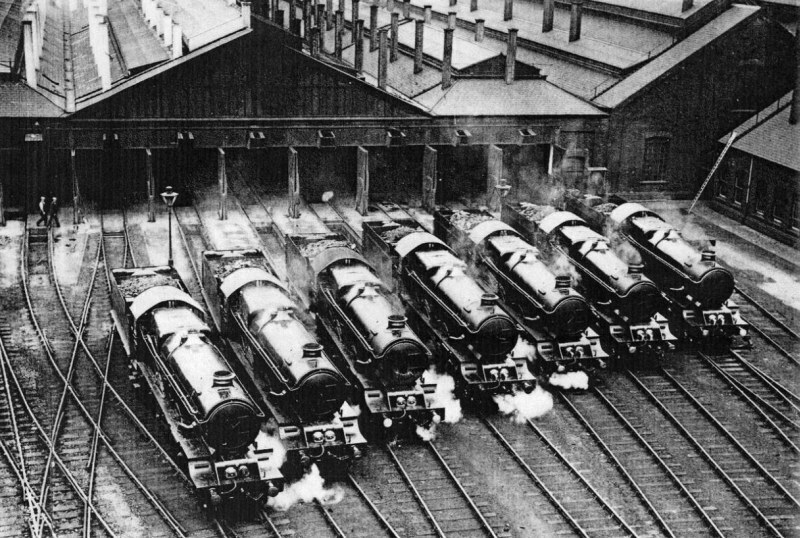 The famous lineup of new Kings outside Swindon running shed in 1927, showing the double water fillers fitted to their initial tenders. These were necessary because water cranes of the 'low, straight arm' style couldn't swing over the height of the rear fenders of the 4000g tenders. The water cranes affected were subsequently modified with higher columns or cranked arms, and 4000g tender production continued with a single central water filler. See this later 1930 picture of a King lineup with single fillers. The Kings, always fitted with 4000g tenders, initially had the long spring hanger style, and this one behind 6012 has had replacement thicker spring shackles. On the Collett 3500g and 4000g tenders, round tank inspection cover plates were located either side of the filler. Image courtesy Brian Daniels. 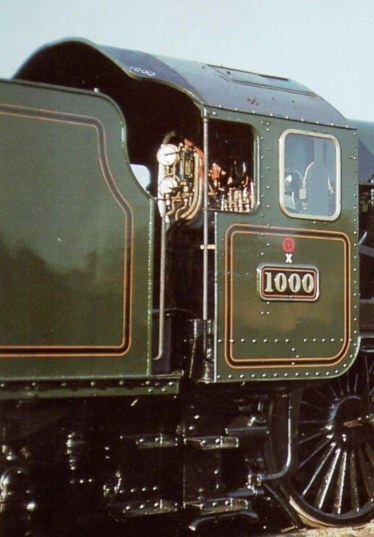 In later days, the Kings seemed to settle into an existence with short spring hanger units and shallow gussets, like this one behind 6008. All Castles from 5013 onward used only 4000g tenders. This 4000g is from a batch with a strengthening modification at the rear of the frame. Hall 5999 in BR(W) mixed-traffic livery. 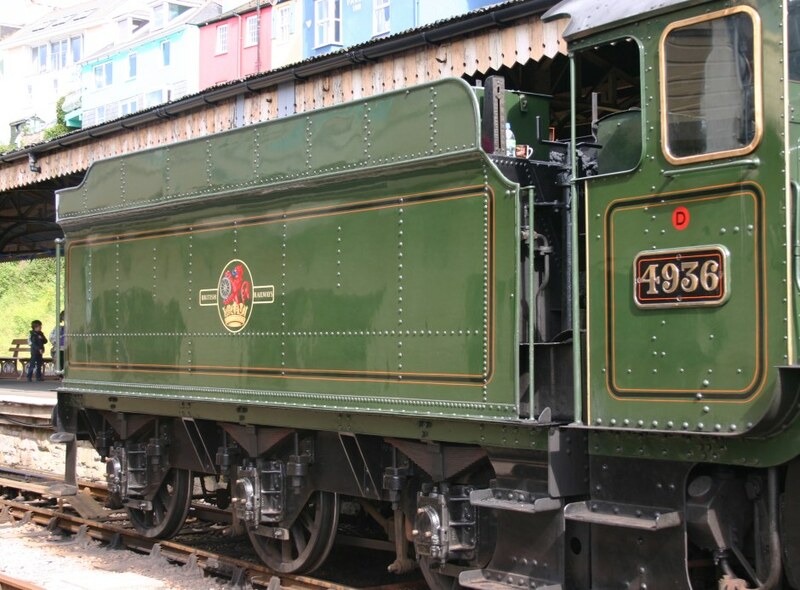 4000g tender, with wide hornplates, short spring hangers and later-pattern long gusset brackets, behind preserved 4936 'Kinlet Hall', at Kingswear in 2012. Picture courtesy of Dave Deane, of Loco Yard. A larger resolution picture is here. 8-wheel 4000g tender number 2586, built in August 1931. 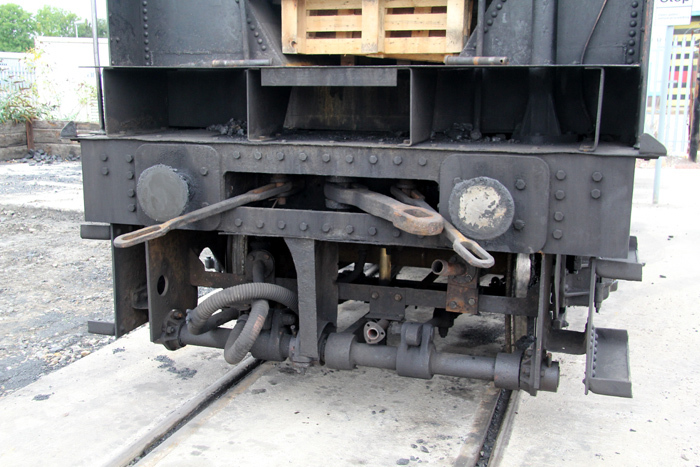 Brake shoes were fitted to the first, second and fourth axles. Drawing courtesy of Paul Hanna. No 3000g tenders were built between 1906 and 1940. Then 50 more were built between 1940 and 1948. They all had the later design deep frames with wide horns. They were mostly found on the 2251 class, but were also used on some of the Bulldogs towards the end of their lives. No 3000g tenders had been constructed since 1906, so presumably 1890s vintage units were coming to the end of their lives. At least two of these tenders have survived into preservation. 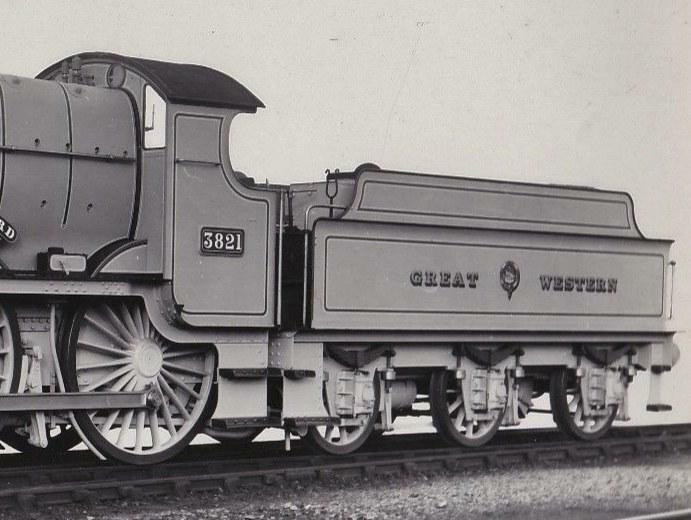 No 3000g tenders with scalloped frames were built new, but there are a few photographs of what must be replacement frames of that design, and they are quite common on GWR weight diagrams and as models. A rectangular bumper was fixed to the dome of many tenders to act as a protector to the water filler handle. The fixture does not seem to have been applied consistently, but can be dated back to c 1930. Picture courtesy Andy Malthouse. 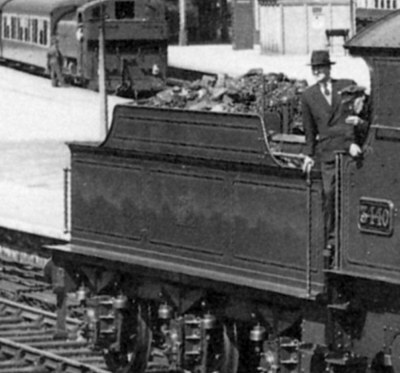 The first of the Hawksworth tenders were built for the Counties. There were 30 of them, and wider (at 8'6") than standard to match the 8'6" wide cabs of the Counties. They were never used on other classes. 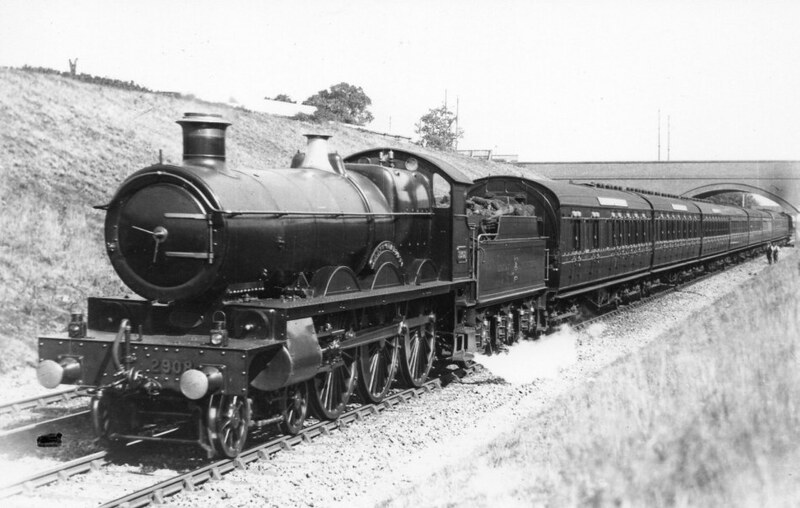 With flush sides and deep slotted frames they were distinctly reminiscent of the LMS 8F units. Coal capacity became 7 tons. Approximate weights were 23 tons empty, 49 tons full. All the 8'6" tenders were scrapped with the Counties. The Great Western Society is building a new one. 107 of these were built from 1947, and were mainly used with Castles and Halls, although a few were seen on Stars. Several of these tenders have survived, and are in active use both on preserved lines and on the mainline behind Halls and Castles. Approximate weights were 23 tons empty, 47 tons full. Few of the tenders from locomotives absorbed by the GWR over this period lasted very long in service. A few tenders from the Llanelli Railway and Dock Co lasted into early years of the 20th century, and some of the tenders taken over from the Bristol & Exeter lasted long enough to be used as water tanks in France during the Great War. These were 4000g tenders with at least 6-ton coal capacity, and had 4'4" diameter 13-spoke wheels. 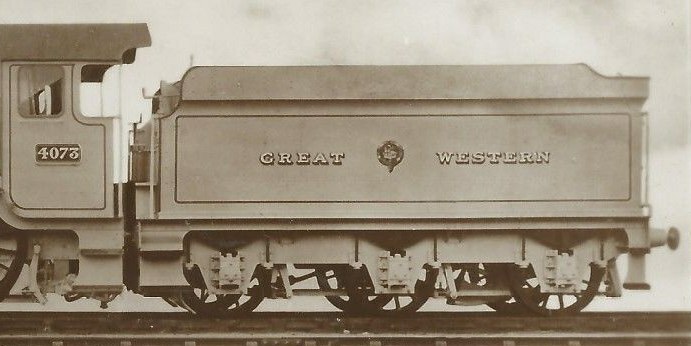 Because (see above) the GWR bought many ROD locomotives that were soon scrapped, there was an excess of these tenders – over 50 more than locomotives. 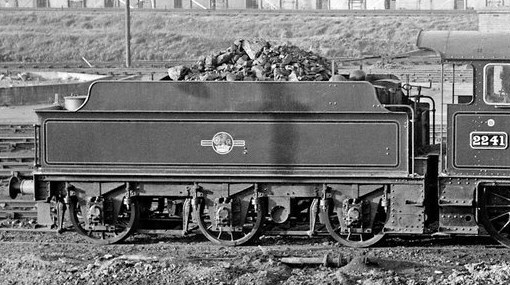 The RODs didn't have vacuum brake gear, but some of these tenders were fitted with train vacuum brake gear and used with Aberdare and a few Collett Goods locos, including 2281–86. 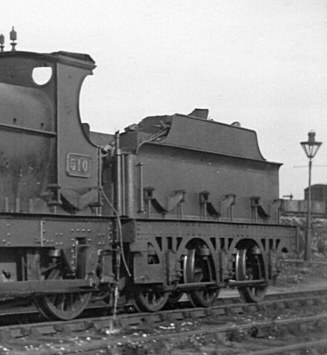 They were withdrawn between 1927 and 1961, but many were converted for various service tasks. Approximate weights were 23 tons empty, 47 tons full. 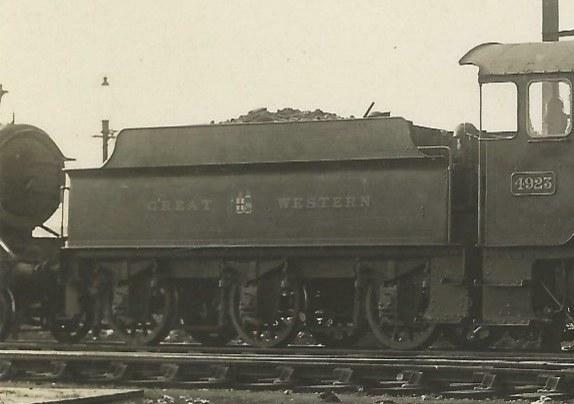 Tenders came to the GWR from the Barry, Cambrian, Taff Vale and M&SWJR lines, mostly on 4-4-0s and 0-6-0s. They were normally withdrawn at the same time as the accompanying locomotives, although Taff Vale and M&SWJR units in particular were often reused as water tanks or sludge tanks and the like. 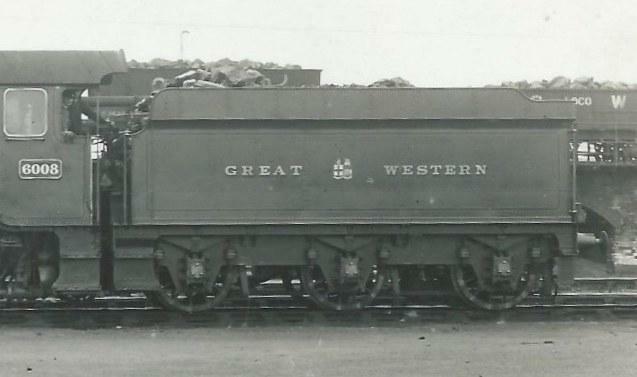 One MSWJR tender which had been used for sludge since the 1930s in the 1960s had both M&SWJR and Great Western lettering visible. 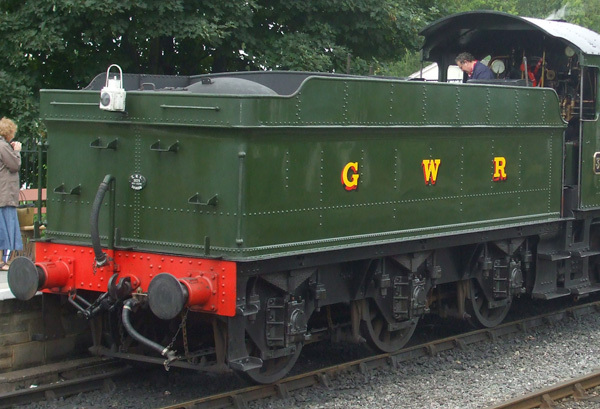 1 GWR Narrow (=Standard) Gauge Locomotive Tenders. 1854-1952 Part 2, Great Western Study Group, 2003. Data from 'Peto's Register' and an article in Steam Railway magazine, No 27. 2 The Locomotives of the Great Western Railway Part Twelve: A Chronological and Statistical Survey, N J Allcock, F K Davies, H M Le Fleming, P J T Reed & F J Tabor, The Railway Correspondence and Travel Society. 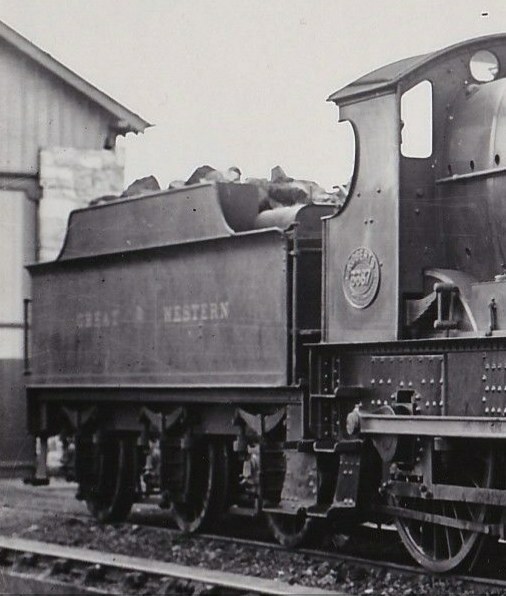 It's normally stated that the whole of the scalloped frame lot were constructed with high sides, and no others, but there are a number of early photos of high sided tenders without scalloped frames. There is no surviving drawing showing the high sides, and the only mention of them in the tender lots register is a note that must have been made some years after the tenders in question were constructed. 3 Around half of the surviving pre-1931 tenders now have later style frames. 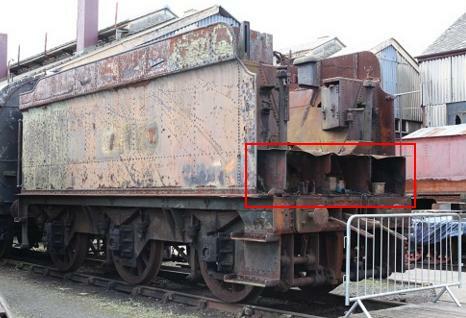 See the Railway Heritage Register database for information on surviving tenders. Drawings are approximately redrawn from Russell and Great Western Study group sources but are strictly representative and may contain errors. Please note the water scoops are drawn in their lowered position.